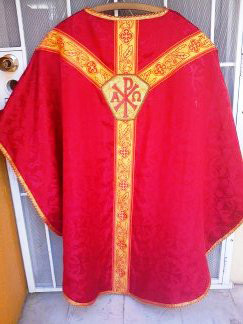 ALL our new Roman & Gothic sets come complete with matching stole, maniple, chalice veil, & burse, fully lined in satin. 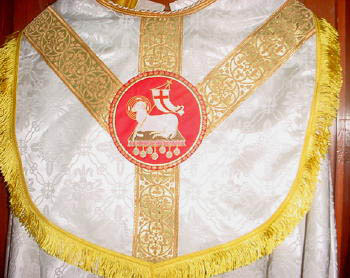 We also make Deacon's stoles, dalmatics, and solemn high mass sets of vestments, funeral palls, and humeral veils. 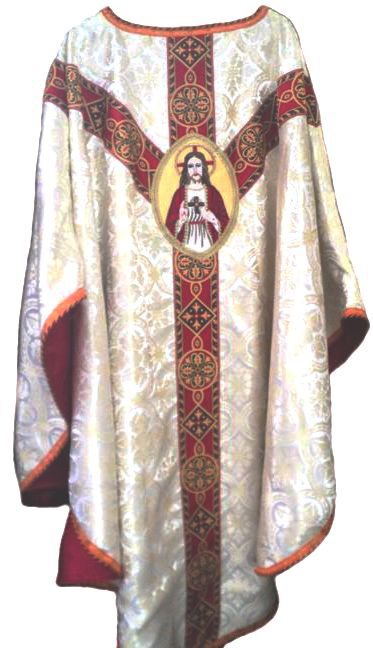 NEW super elegant Roman chasuble made with a beautiful antique vesica of the Holy Trinity from France which is all hand embroidered. 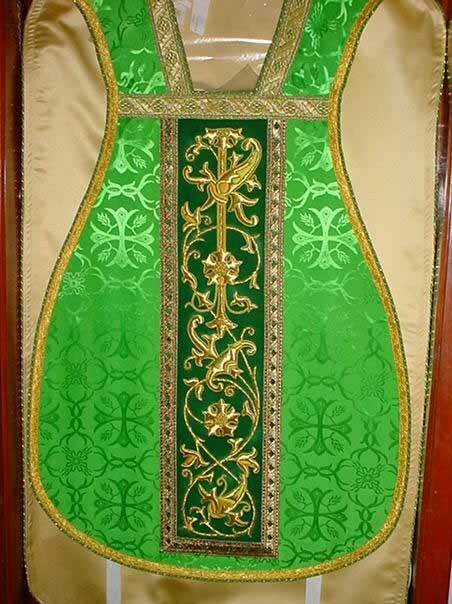 We can make a new traditional set of vestments using many different components, sometimes antique or recycled from old vestments to make a truly magnificient set. 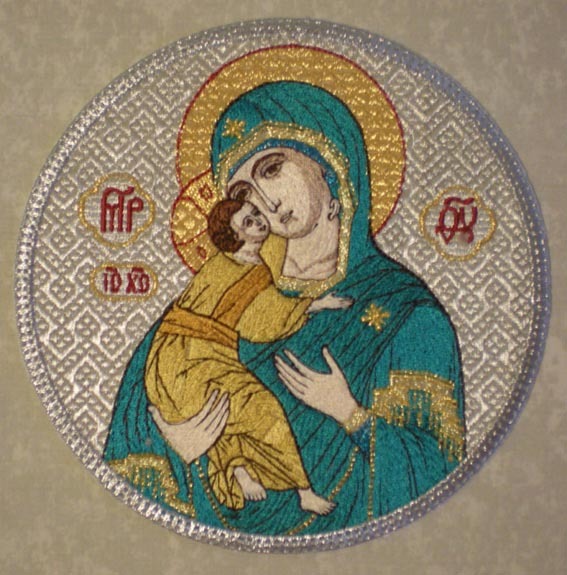 We can use this beautiful hand embroidered vesica on ANY color vestment you wish. This is a new design we have which is available in many different colors. 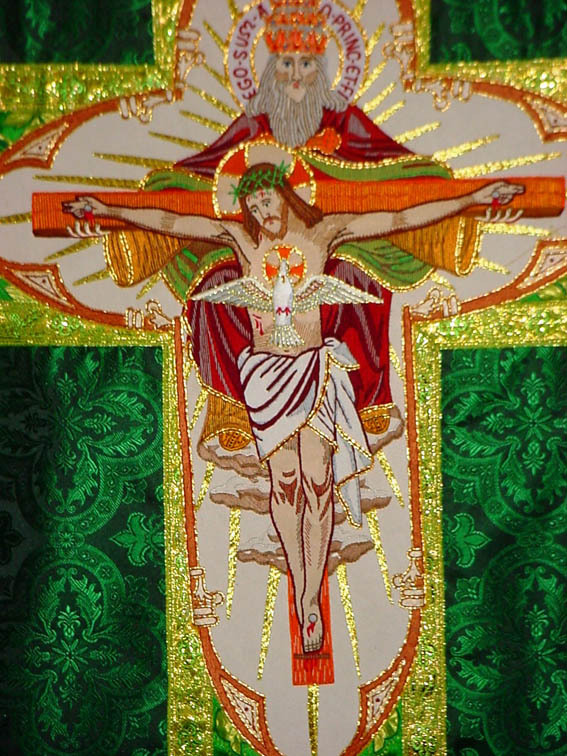 The Trinity vesica is all hand embroidered. Using imported European brocade fabric & galloons. 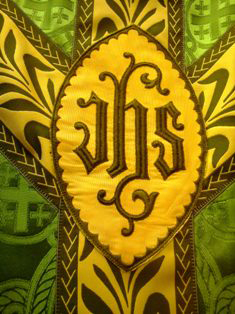 Each vestment is made one at a time, not on an assembly line. All our vestments are made in our quaint little shop. These are not cheap imports from China or India. Only the finest quality materials and workmanship go into each vestment. 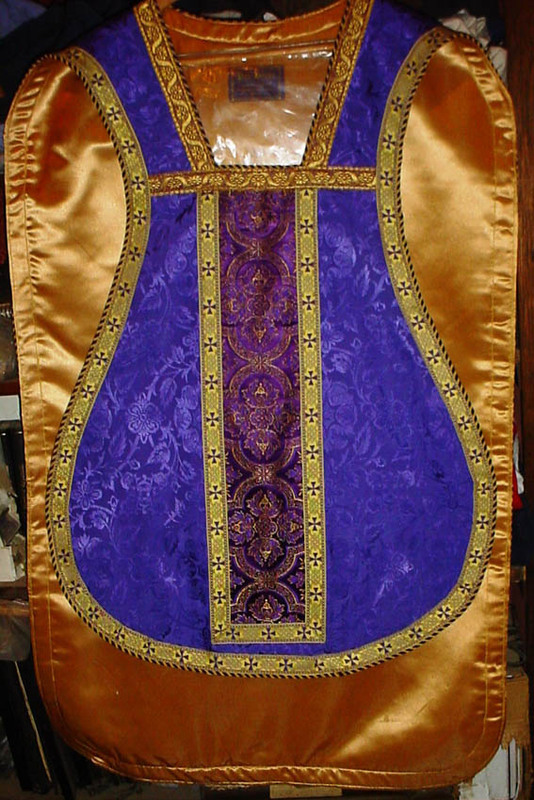 The chasuble measures 43" long by 27" wide.Comes complete with matching stole burse, maniple and chalice veil. 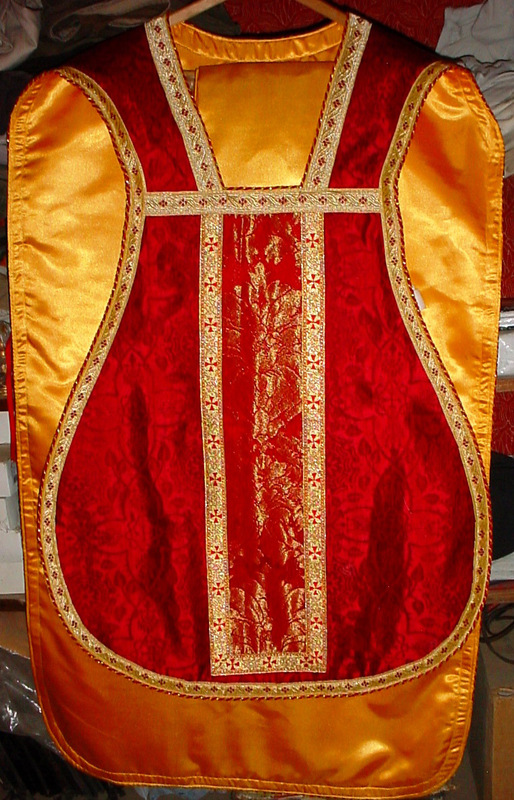 All hand embroidered vesica, lined in burgundy satin. All five parts complete. Shipping extra by EMS. PRICE: $699. 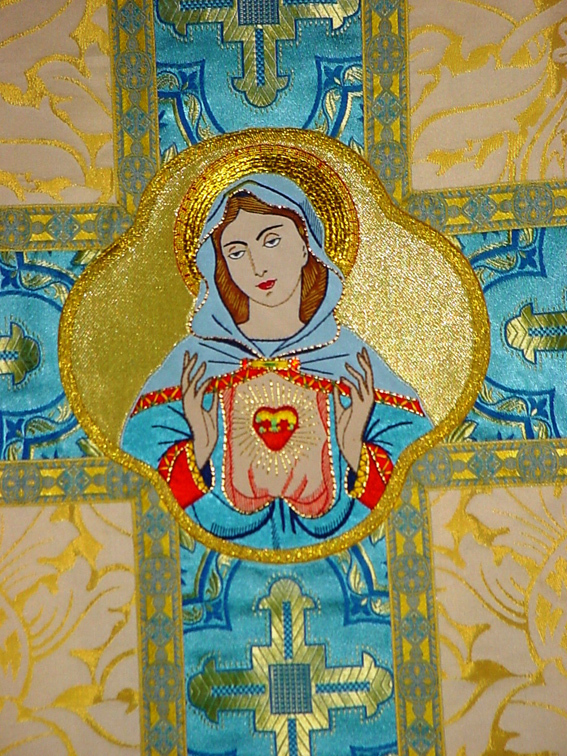 This is a new design using a HAND EMBROIDERED vesica of the Immaculate Heart of Mary. It is made with the finest imported brocade and galloons from Europe. It is our standard size which measures 27" wide x 43" long. 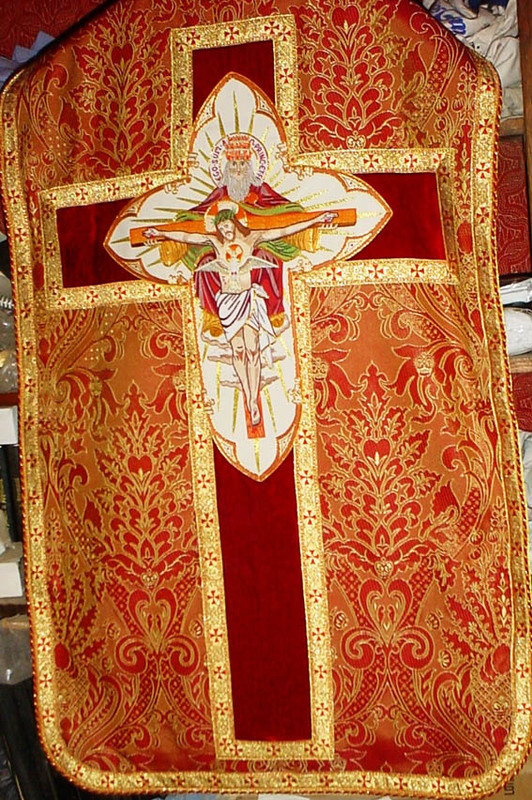 We can make this and other vestments longer or shorter if needed. 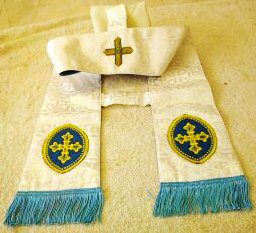 Comes complete with matching stole, burse, maniple , & chalice veil. . 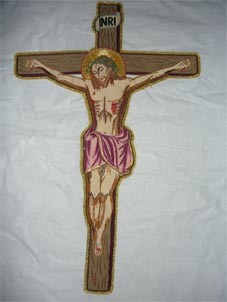 This is a new design using a HAND EMBROIDERED vesica of the CRUCIFIX. It is made with the finest imported brocade and galloons from Europe. 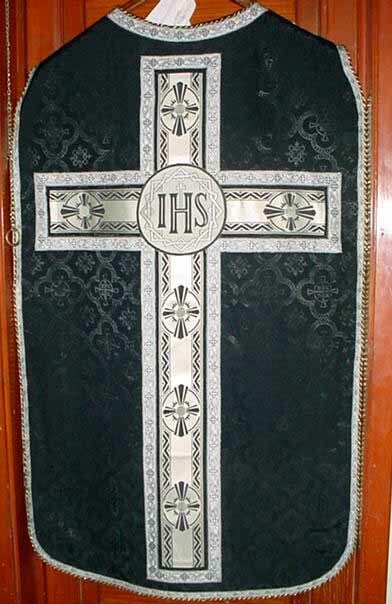 It is our standard size which measures 27" wide x 43" long. 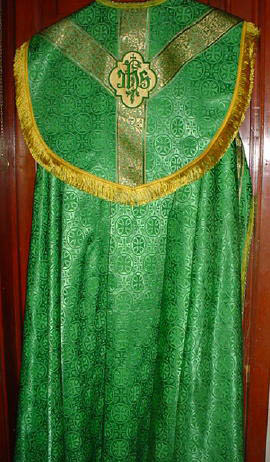 We can make this and other vestments longer or shorter if needed. Fully lined in gold satin. 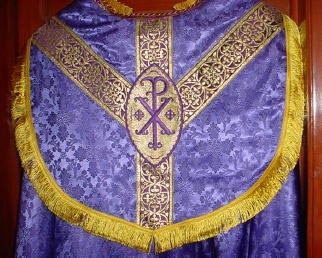 Comes complete with matching stole, burse, maniple , & chalice veil. 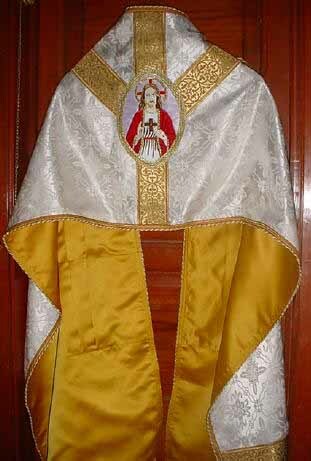 THIS IS THE IDEAL VESTMENT TO USE DURING LENT. This is a new design using a HAND EMBROIDERED vesica of the Angus Dei. It is made with the finest imported brocade and galloons from Europe. 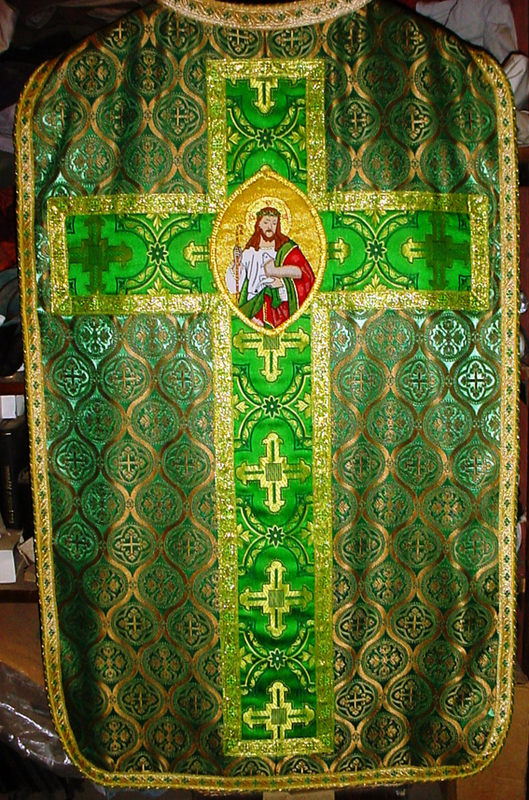 It is our standard size which measures 27" wide x 43" long. Fully lined in gold satin. 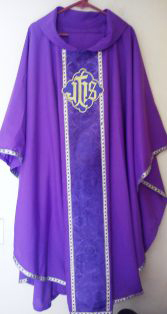 We can make this and other vestments longer or shorter if needed. 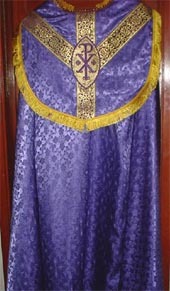 Comes complete with matching stole, burse, maniple , & chalice veil. 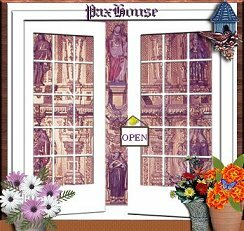 Ideal to use durng Lent or Advent. . 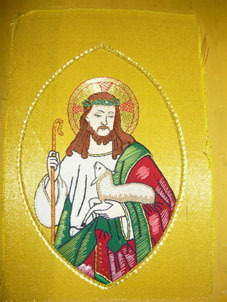 This is a new design using a HAND EMBROIDERED vesica of the Good Shepherd. It is made with the finest imported brocade and galloons from Europe. It is our standard size which measures 27" wide x 43" long. Fully lined in gold satin. 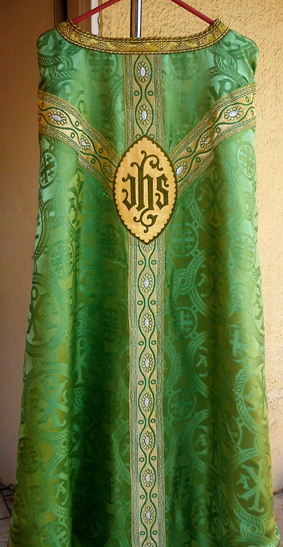 We can make this and other vestments longer or shorter if needed. 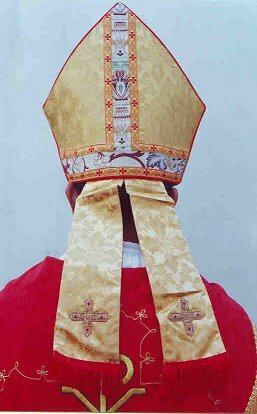 Comes complete with matching stole, burse, maniple , & chalice veil. Ideal to use durng Lent or Advent. 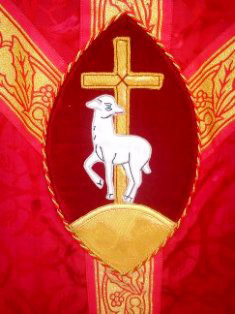 This is a new design using a HAND EMBROIDERED vesica of the Good Shepherd. It is made with the finest imported brocade and galloons from Europe. 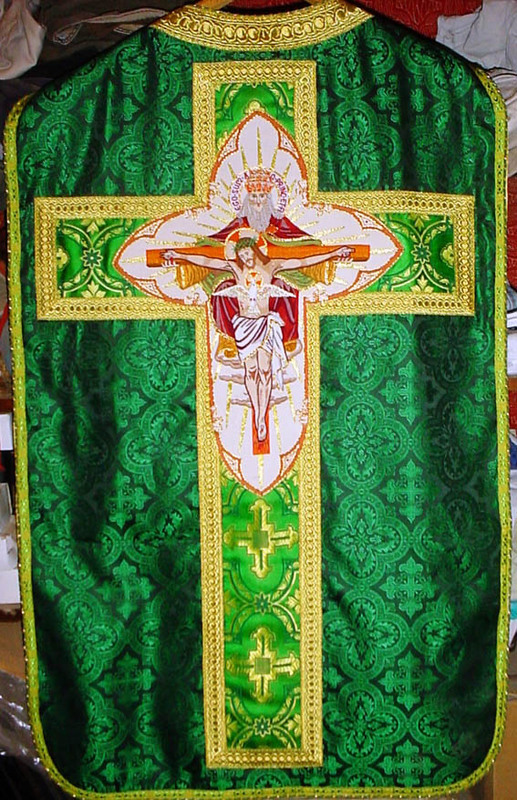 It is our standard size which measures 27" wide x 43" long. Fully lined in gold satin. 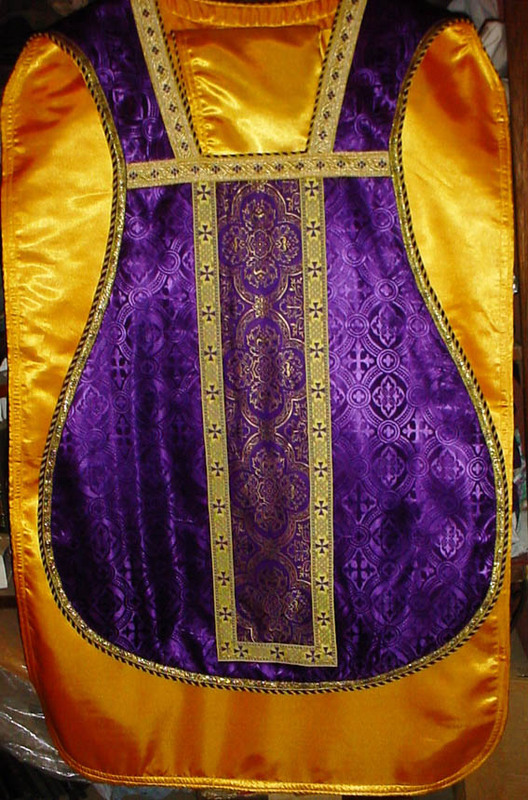 We can make this and other vestments longer or shorter if needed. 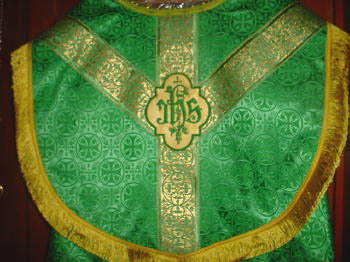 Comes complete with matching stole, burse, maniple , & chalice veil. Ideal to use durng the Season of Trinity. This is a new design using a HAND sewn gold metallic motif bandng of grapes & Wheat. It is made with the finest imported brocade and galloons from Europe. It is our standard size which measures 27" wide x 43" long. Fully lined in pastel olive green satin. 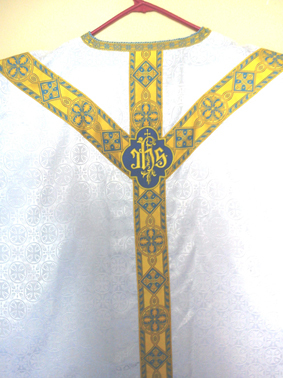 We can make this and other vestments longer or shorter if needed. 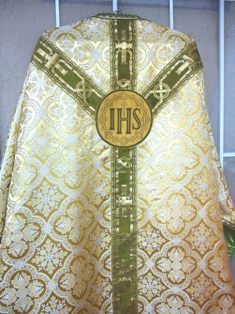 Comes complete with matching stole, burse, maniple , & chalice veil. Ideal to use durng the Season of Trinity. 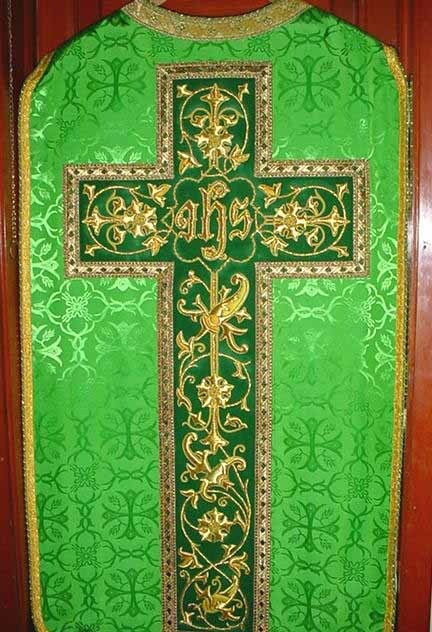 Gold metallic Brocade makes the green cross on back super fine with imported hand sewn vesica of green velvet. Lined in a pastel green satin. Edged in imported French galoons & piping. 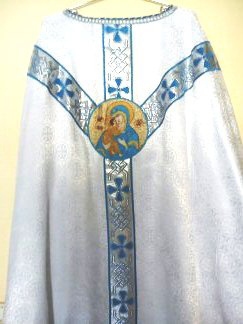 This new Marian set is made of a beautiful blue liturgical Brocade, outlined in imported French gold metallic galoons. 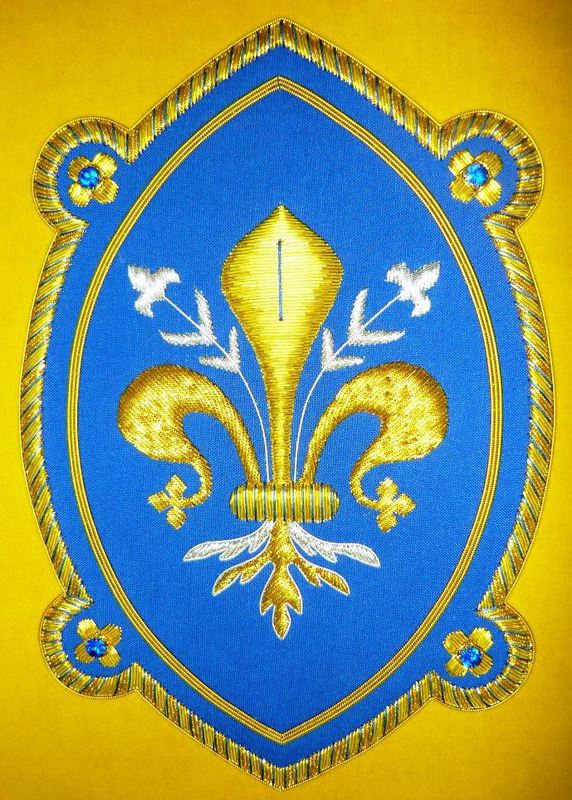 The vesica and appliques are machine embroidered on blue velvet. Lined in a dark blue satin. 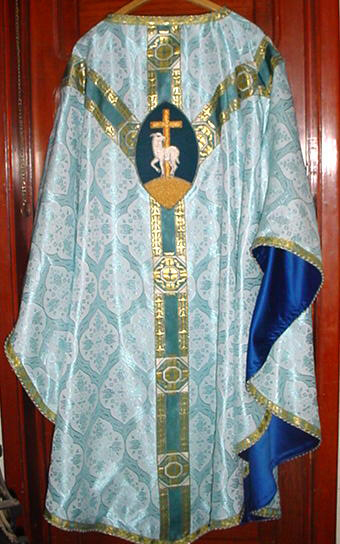 Blue vestments have been traditionally used in Latin speaking countries for centuries, especialy in Spain where they always used blue vestments in the Toledo Rite. 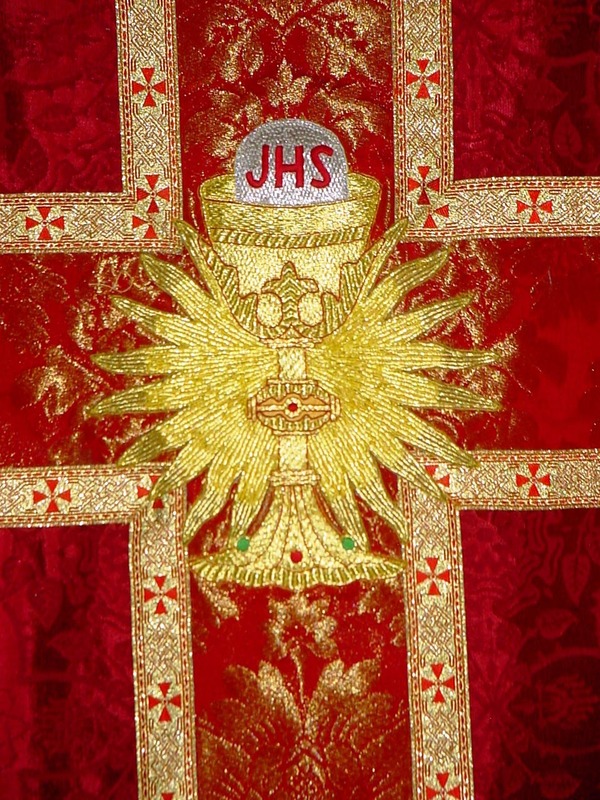 In England it has been used in the Sarum Rite and many Anglo-Catholic churches throughout Great Britain, Canada, the U.S. and elsewhere. 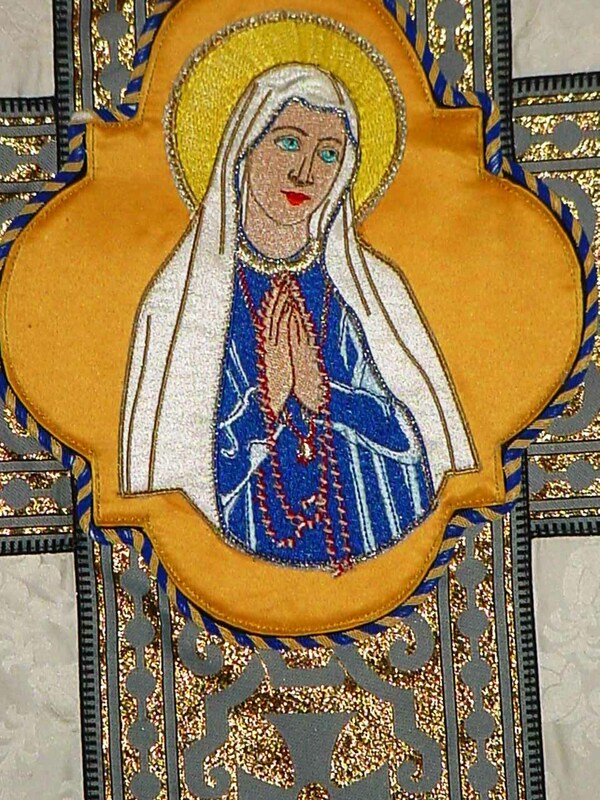 The BVM vesica on the back is machine embroidered in our own work shop. 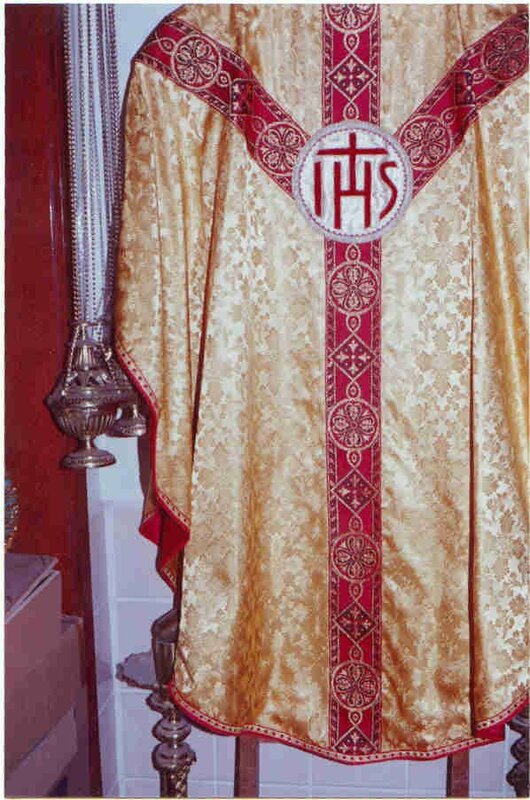 The cross and chasuble and chalice veil are outlined in gold metallic imported galoons and piping from France. Fully lined in light blue satin. Marian Roman set made of cream white matte finish. Jacquard Brocade material, edged in imported French galoons and piping. 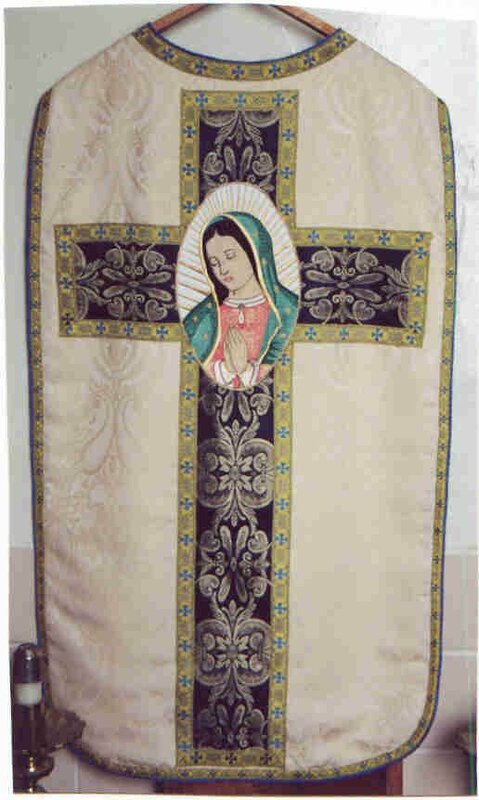 Has beautiful machine embroidered vesica of Our Lady of Guadalupe on the back. Lined in blue satin. 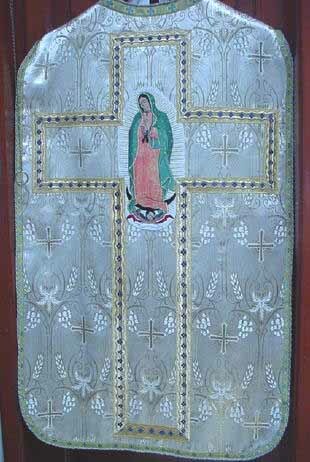 The cross is navy blue with gold motif. A tasteful and reserved set! Made with imported piping, galloons, vesica. 43" long x 27" wide. 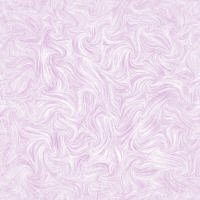 Lined in lavender satin. 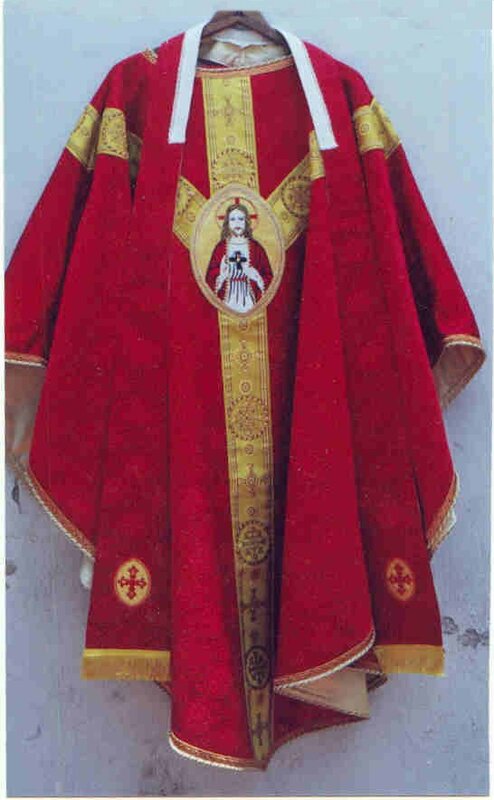 Comes with stole, maniple, chalice veil & burse. 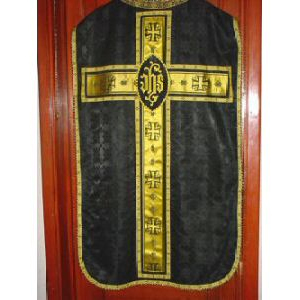 New baroque requiem vestment set This new set is made of black & gold jacuard fabric imported from England. It is made with imported French galloons. It is fully lined in gold satin. 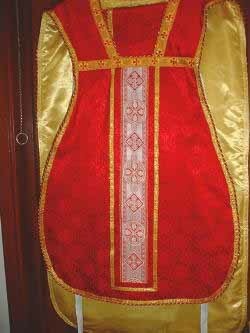 The chasuble measures 43" long by 27" wide which is our standard size for all our Roman vestments. 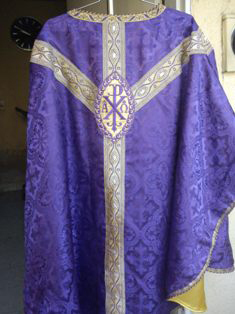 Comes complete with stole, burse, maniple, and chalice veil. 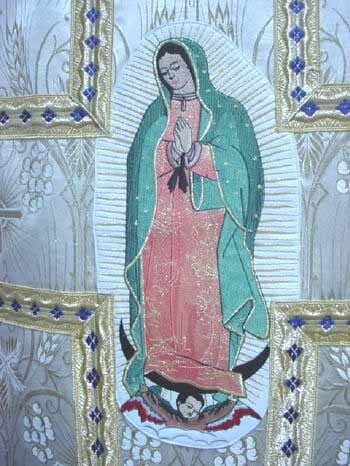 NEW fancy schmancy elegant ornate white satin & gold metalic Marian vestment with embroidered vesica on back of Our Lady of Guadalupe. Fully lined in blue satin. 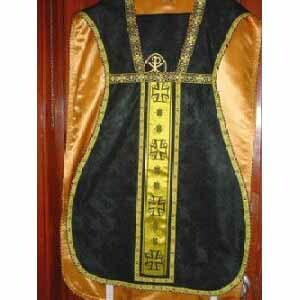 Complete set, stole, burse, maniple, chalice veil, chalice pall. $500. 43" long, 27" wide. Entirely made by our good sisters. 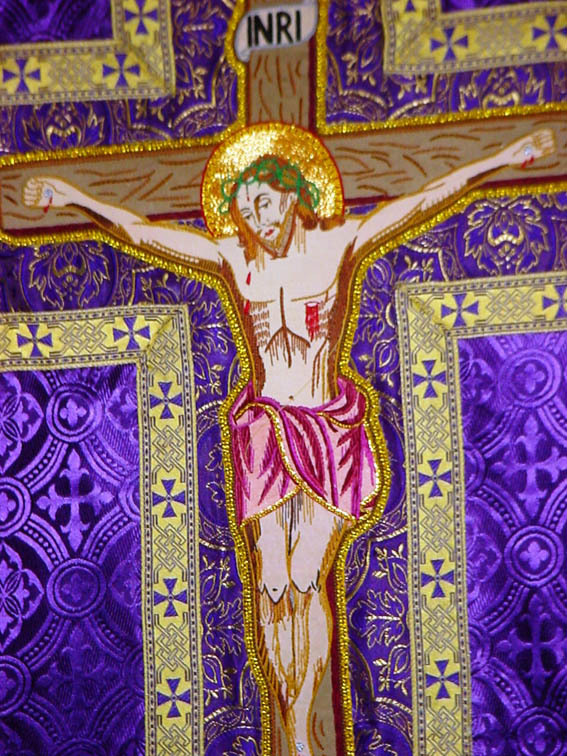 Beautiful royal purple Brocade material with gold metallic cross design on back with hand sewn vintage ChiRho vesica of gold metallic thread on purple velvet from Spain. Outlined in French galoons and piping. All parts fully lined in either lavender or gold satin. 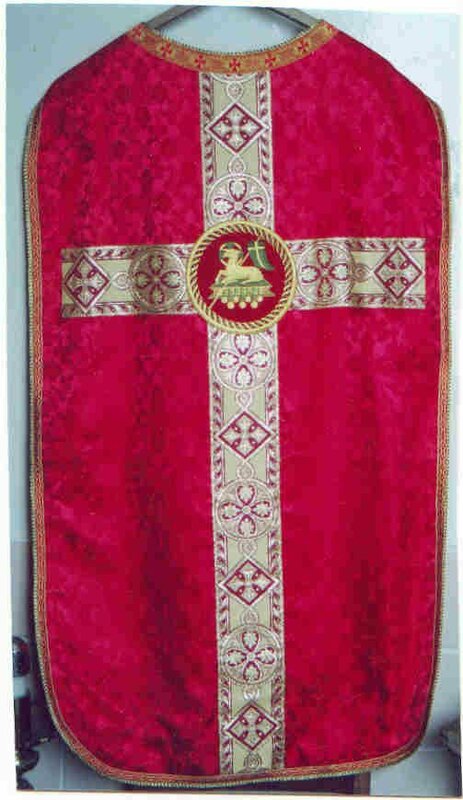 Red Brocade Roman set of Liturgical motif. Lined in gold satin. Orphery banding is gold metallic. 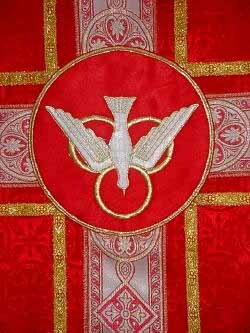 Available with Holy Ghost, Sacred Heart, Angus Dei, IHS or ChiRho vesica on back. Edged in imported French galoons and piping. 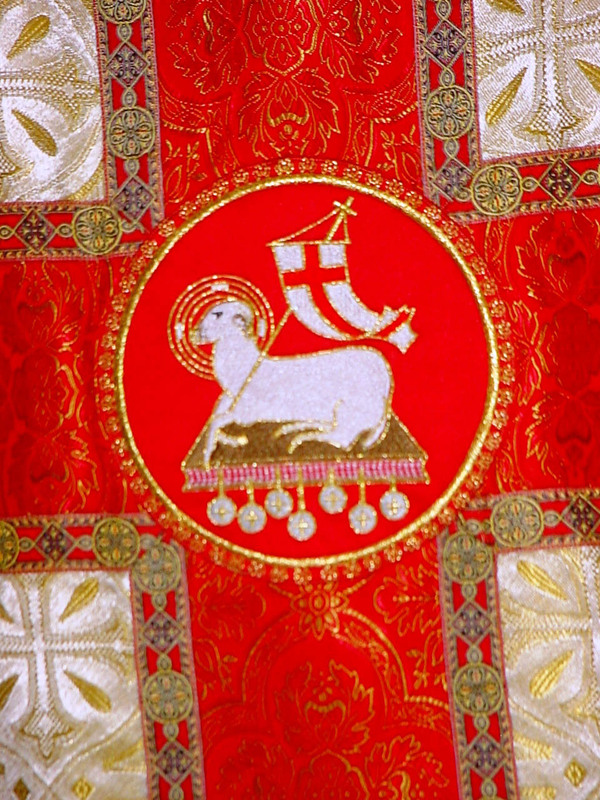 Red Brocade Roman set made with gold metallic orphery banding and machine embroidered Agnus Dei vesica on back. Black Brocade, silver orphery banding and imported galoons & piping from France. Lined in a gray satin. Exceptional value for the price! 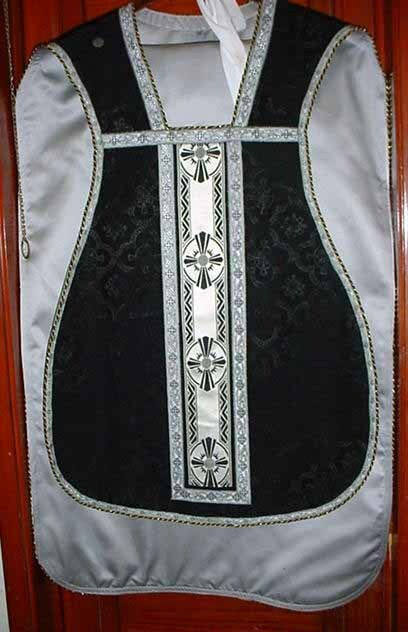 We also make black Brocade funeral palls of similar designs and materials, fully lined. 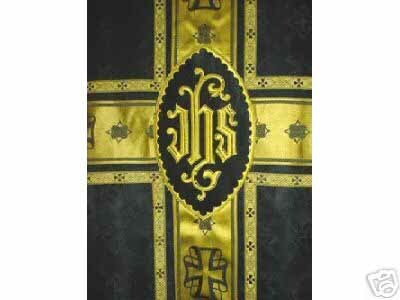 NEW black satin brocade Requiem Roman vestment with gold satin orphery bandings, galloons & piping. Fully lined in gold satin. 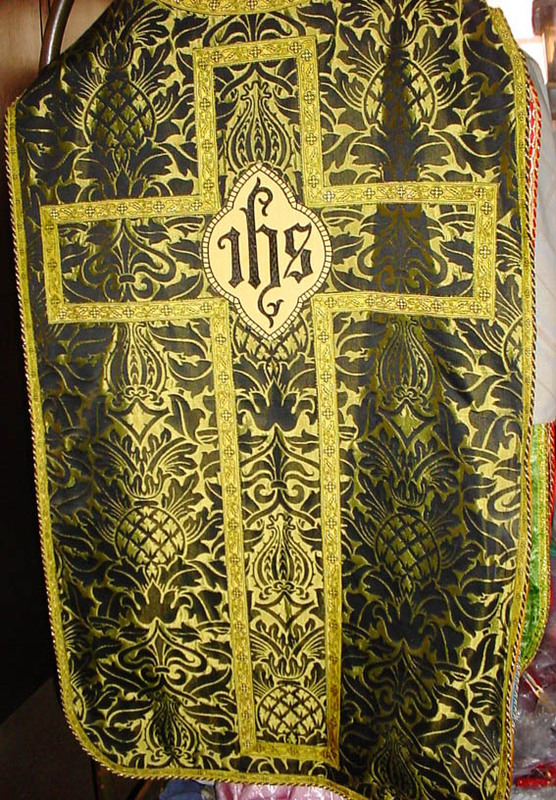 Black brocade is imported from England. 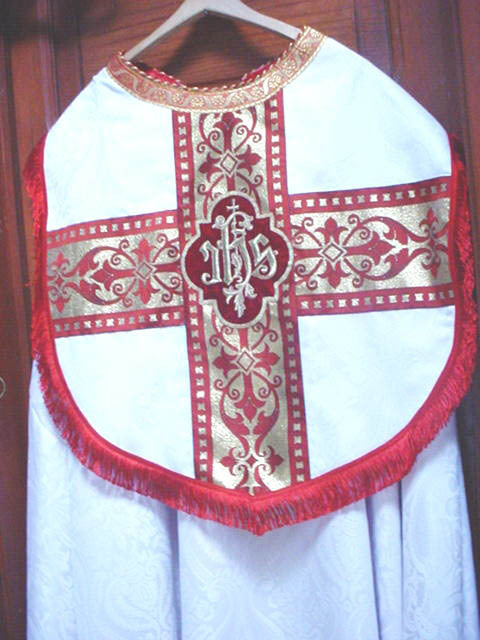 Comes with matching stole, maniple, burse & chalice veil & chalice pall. Measures 43" down the back, 27" wide. 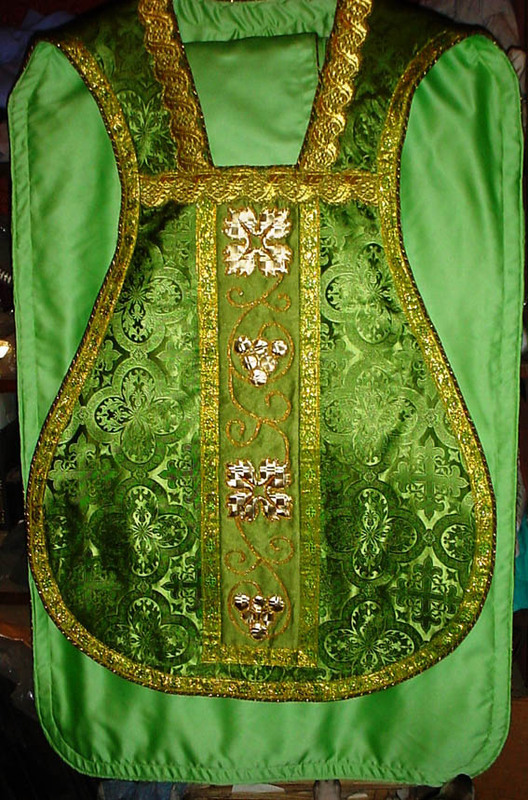 Beautiful green brocade, traditional orphery banding & vesica, imported piping and galloons. 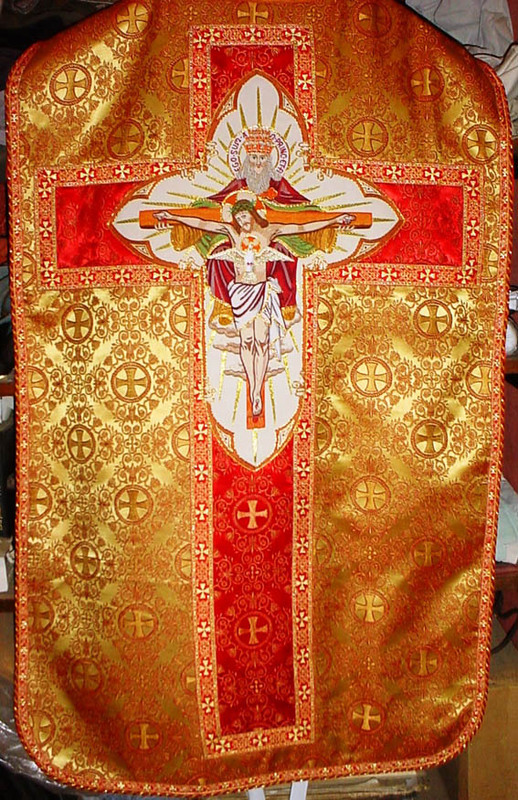 Chasuble is 43" long x 27" wide. Lined in gold satin. 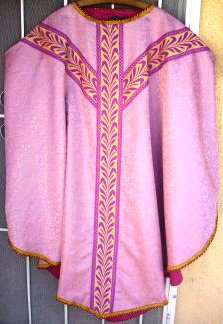 Comes with matching stole, burse, maniple & chalice veil. Made of a pleasant pastel pink Jacquard material with imported galoons & piping from France. 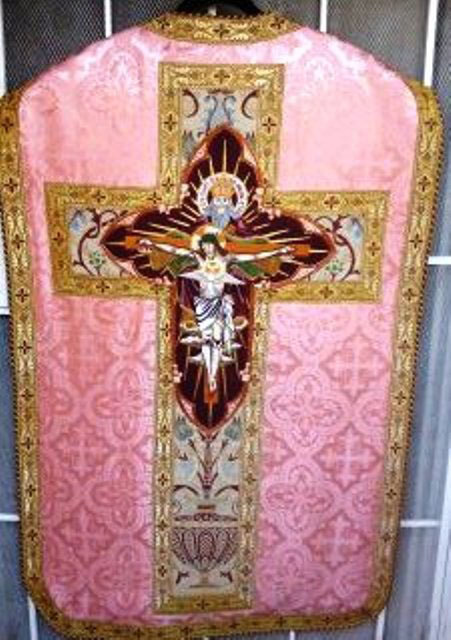 The large Cross on back and front is Coronation Tapestry from India. All parts are fully lined in purple satin. 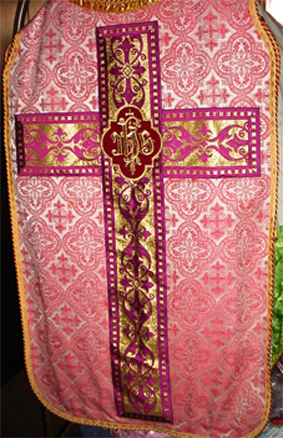 This is only one example of many Rose vestments we make. 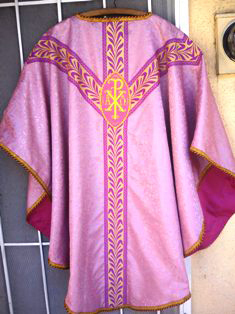 Rose or pink vestments are only used on TWO Sundays in the liturgical year, i.e. Gaudete Sunday, the third Sunday of Advent, so named because of the first word of the introit which is the Latin imperative of the verb "rejoice". 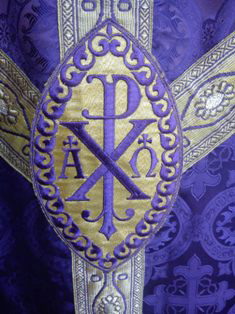 The other, Laetare Sunday, the fourth Sunday of Lent, so named because of the first word in the Latin antiphon before the introit. 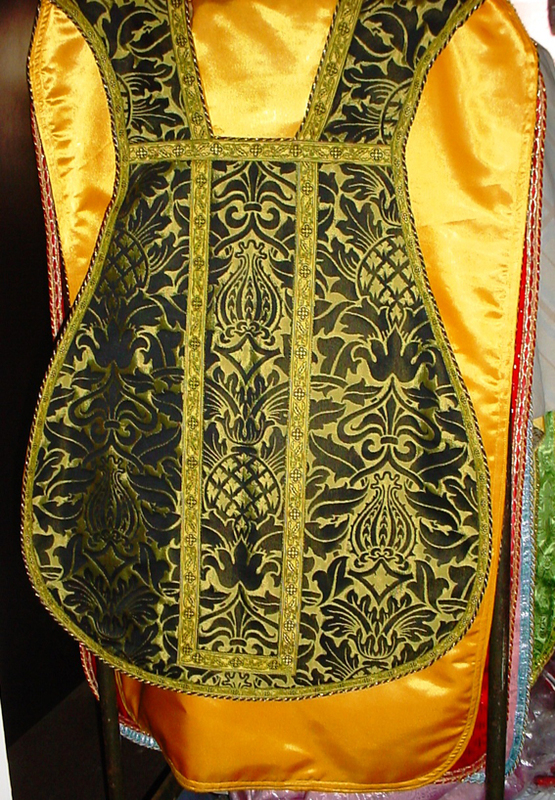 NEW ornate vestment with new hand embroidered gold bullion thread, imported from Europe. 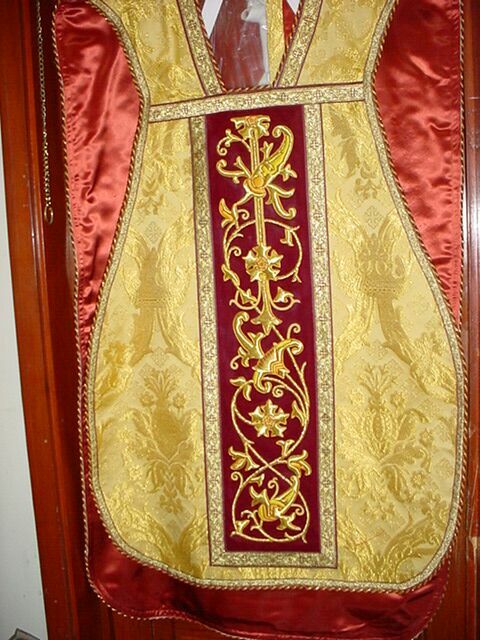 We make these vestments here using these imported panels. 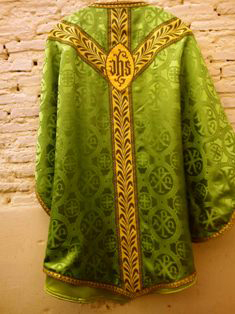 These vestments are available in most liturgical colors. These are the same designs which were made over 100 years ago being reproduced in Europe again today. 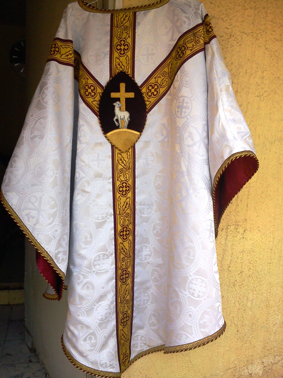 Fully lined in satin, and comes complete with matching stole, maniple, chalice veil, and burse. 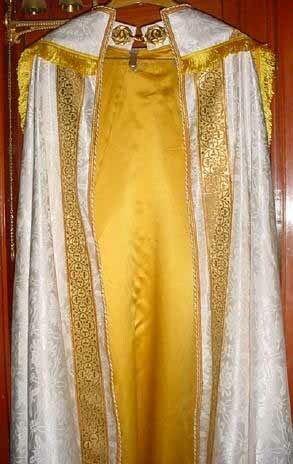 NEW VERY ORNATE all Gold bullion vestment. 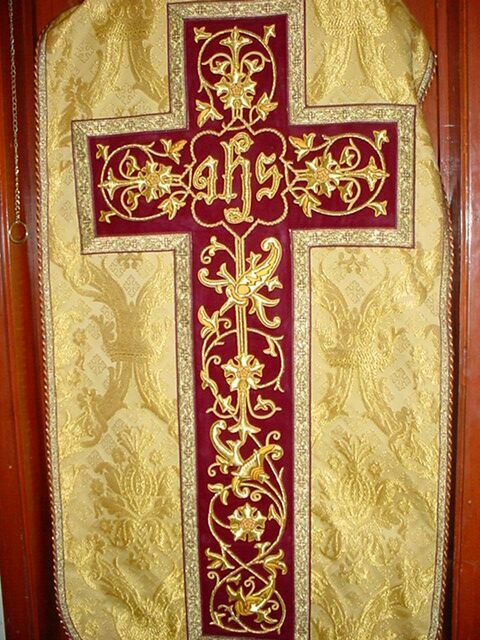 All hand embroidered European cross in gold thread with burgundy background. Fully lined in burgundy satin. 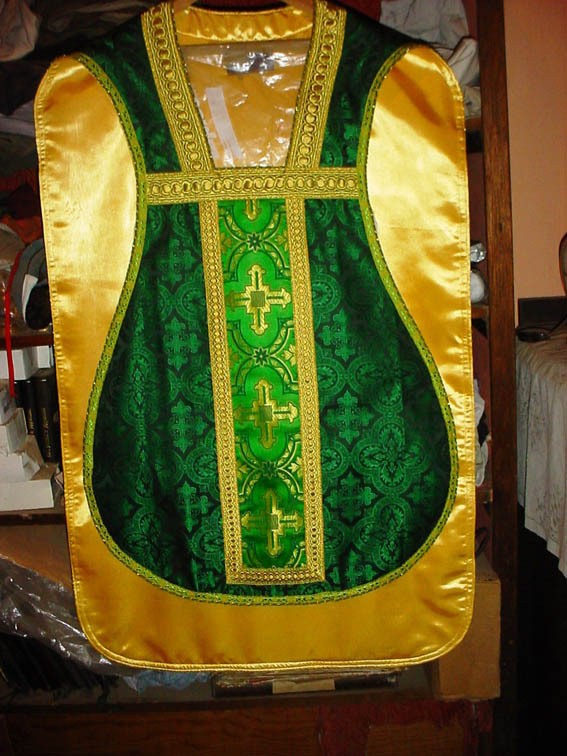 43" down the back..
Comes with matching stole, burse, chalice veil, and maniple. It is the finest we make. 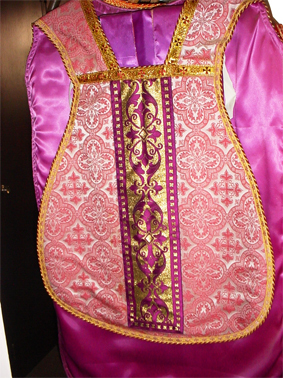 Click Here to see front view of vestment. 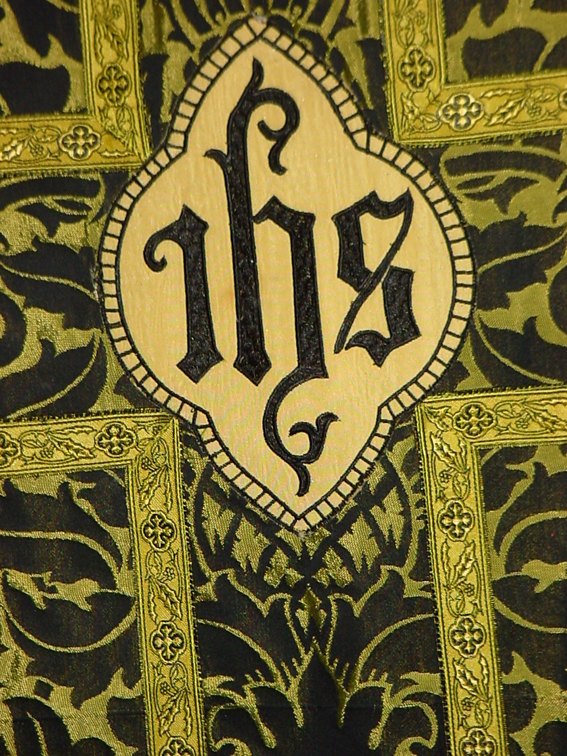 Click Here to see detail of embroidered design on back of vestment. 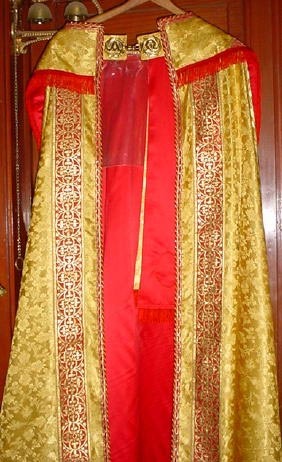 RED SATIN BROCADE ROMAN VESTMENTS..
Made of Liturgical fabric, traditional bandings. Chalice with Rays vesica, or you can have another vesica from the list below.} Lined in gold satin. 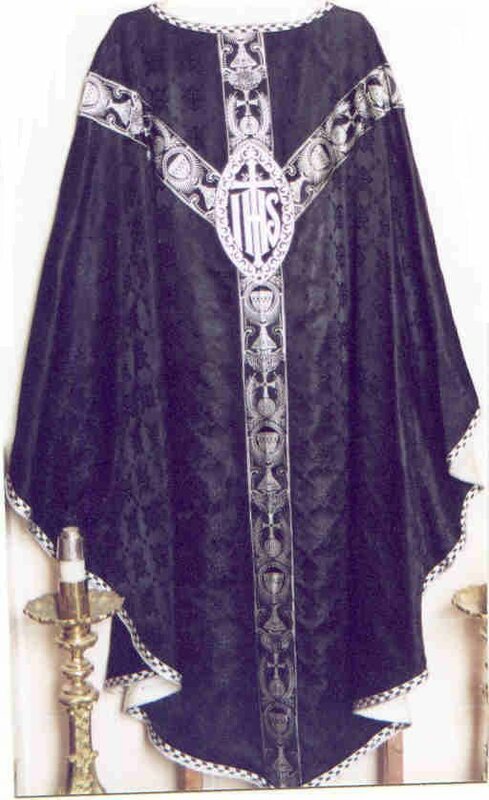 Comes with matching stole, burse, maniple, & chalice veil. ALL new , made in our little shop by our good sisters. This is no cheap import from China or India. Individually made one at a time. Not mass produced on an assembly line. You havent seen quality like this in years! 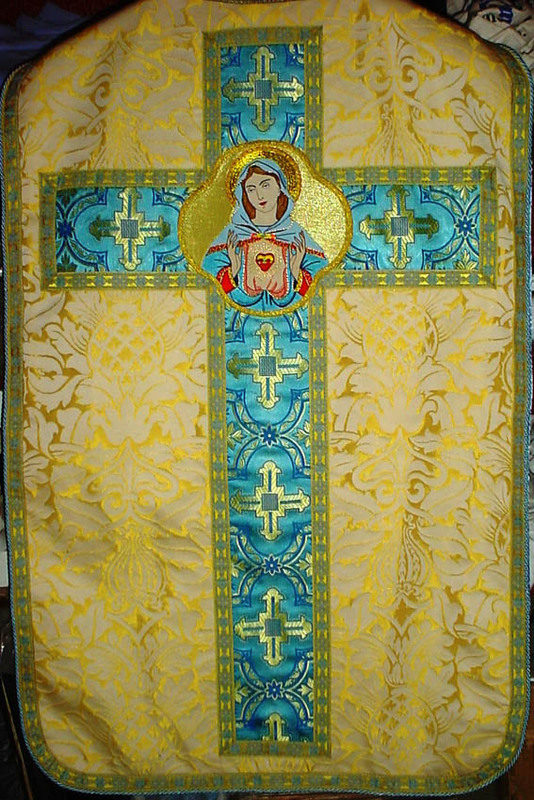 Measures 43" long x 27" wide. Made with vintage olive green orphery banding and imported French piping & galloons. Fully lined in pastel green satin. Measures 48" down the back. 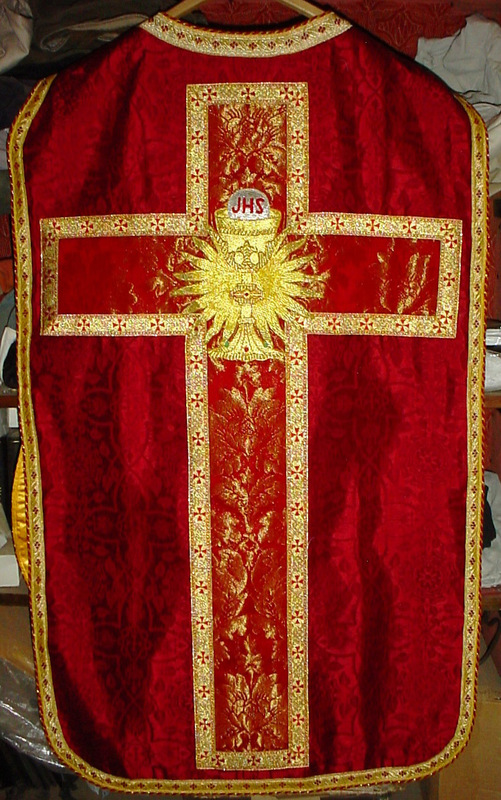 Y cross on both sides of chasuble. The ideal set to use on St. Patrick's Day. 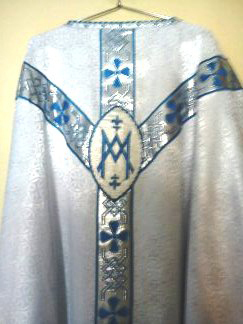 NEW WHITE GOTHIC MARIAN SET vestment. Made with beautiful imported white satin brocade fabric, lined in blue satin, French galloons. 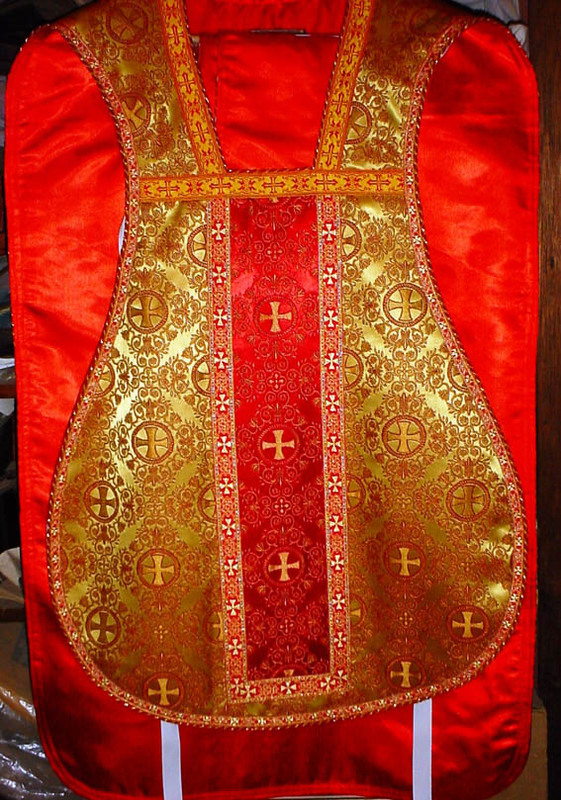 Chasuble is 48" long. 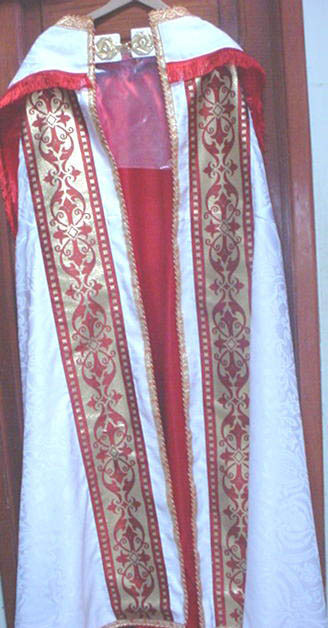 Comes with stole, maniple, burse & chalice veil. . 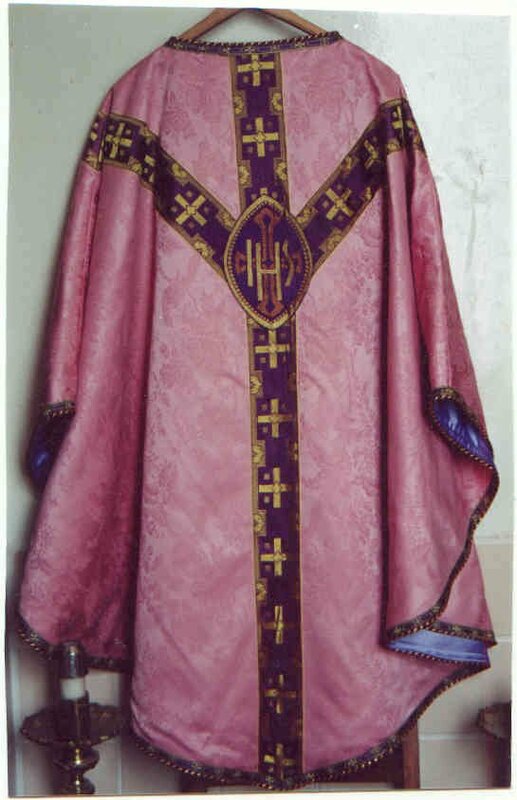 Imported violet brocade set complete with chasuble 48" long, maniple chalice veil, stole, burse. Imported french galloons and orphery banding. Various vesica designs are availble. 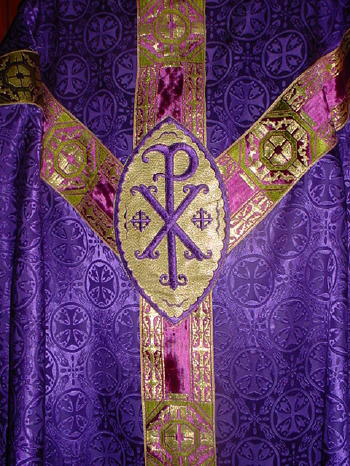 The ideal vestment for Lent & Advent. 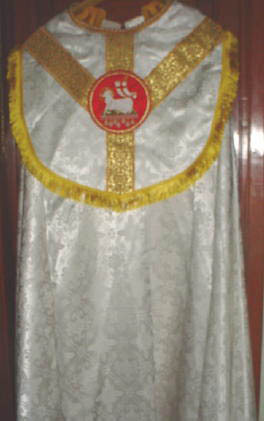 Complete set with stole, maniple, burse & chalice veil. Made of pastel fabric with vintage wheat design orphery banding. Lined in burgundy satin. 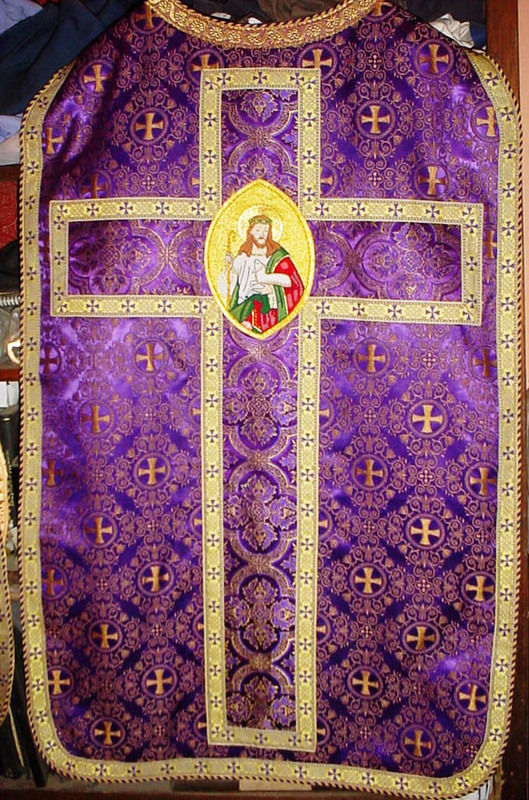 Used during Advent & Lent. Olive green gothic. Comes with all five parts. Lined in pastel olive satin. Gold metallic banding. 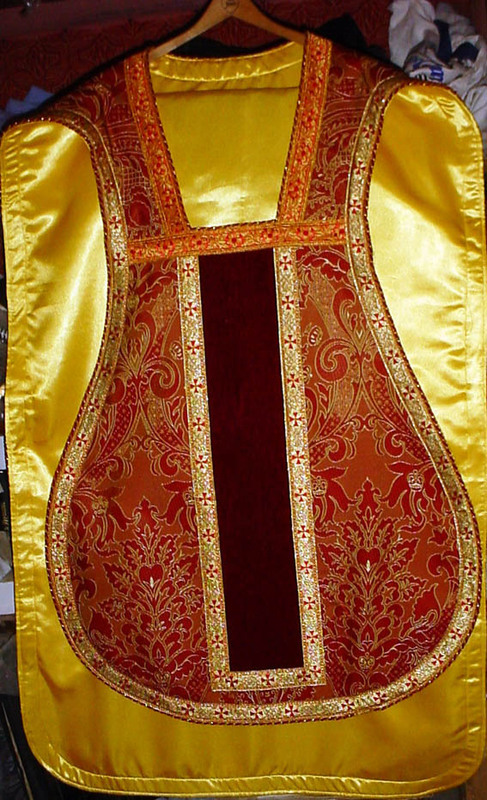 all gothic vestments are 48" long. 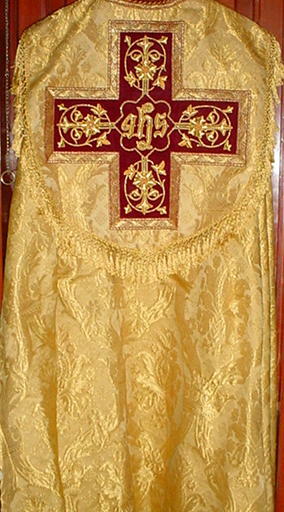 all gothic vestments are 48" long. Price $500. with $35 for EMS shipping.. Lined in pastel olive green satin with olive & metallic banding. Comes with all five parts.,48" long. & Price is $500, with $35 for EMS shipping. 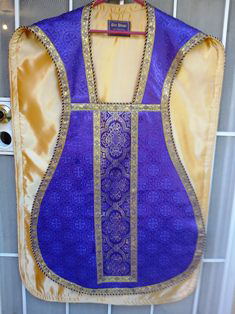 NEW lite weight summer ware violet Gothic chasuble & stole. Made of polyester material, UNlined, rolled collar. Comes with matching stole. 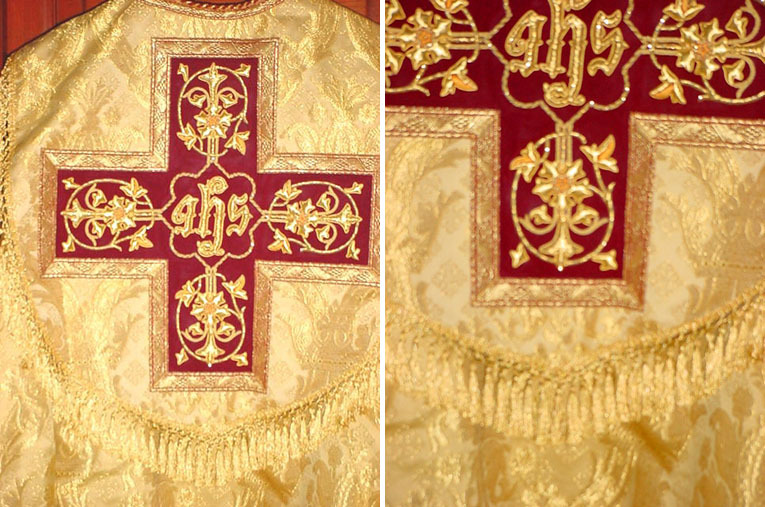 If you would like a matching burse, maniple & chalice veil, ADD $50 for the three pieces. .
Made with imported gold satin orphery bandings, galoons and piping surrounding the chasuble & chalice veil. 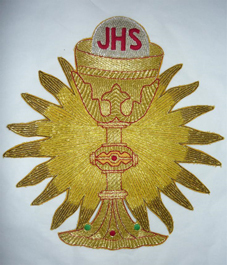 Machine embroidered Sacred Heart of Jesus vesica on the back. Fully lined in gold satin. 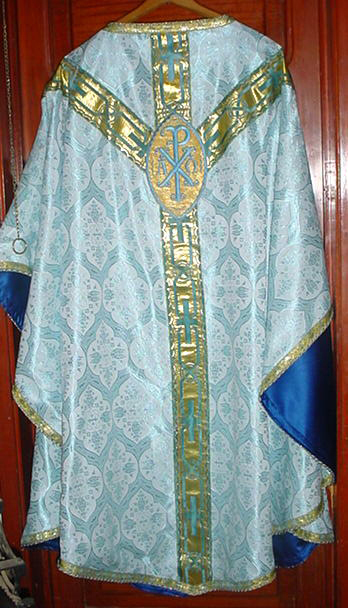 Magnificent NEW blue Gothic Marian vestment. Only from your pals at Pax House! 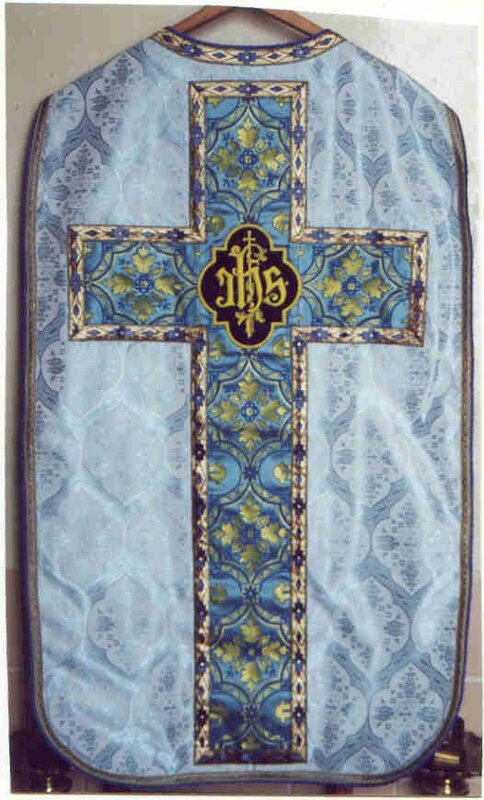 Our good sisters make this magnificent COMPLETE & TRADITIONAL blue set of Gothic vestments. 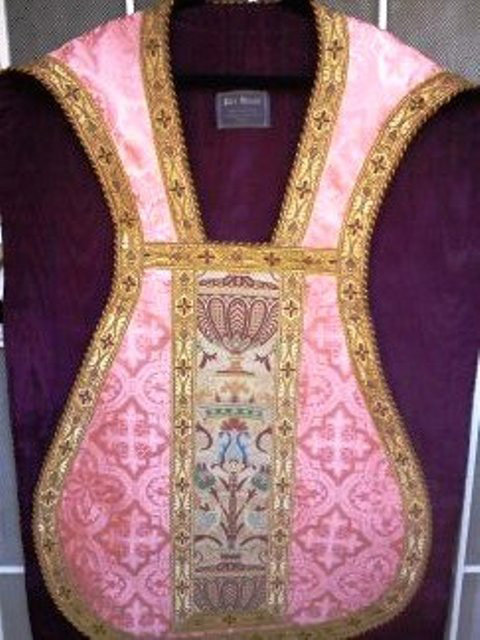 Made of satin brocade and very ornate. 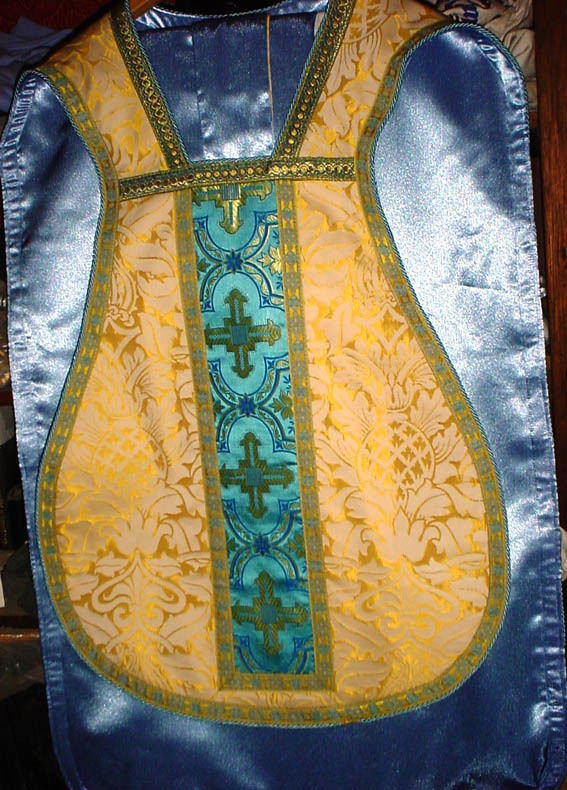 It is fully lined in Episcopalian blue satin. 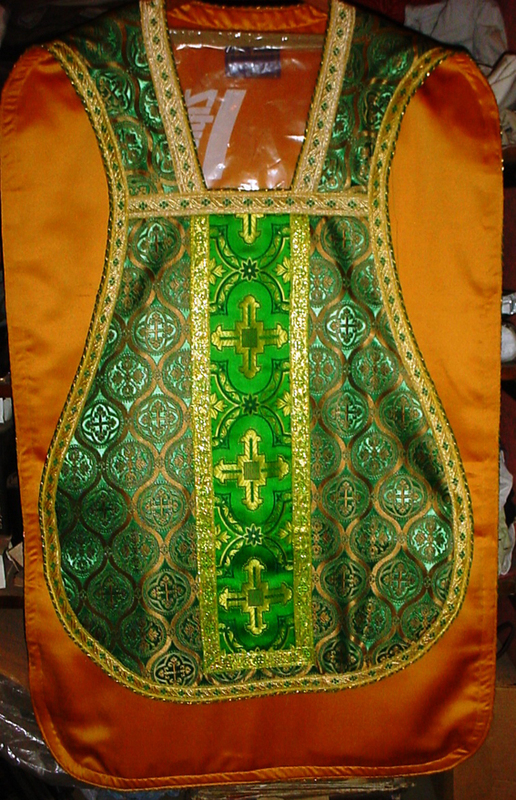 The chasuble measures 48" down the back x 24" down the sleeve. 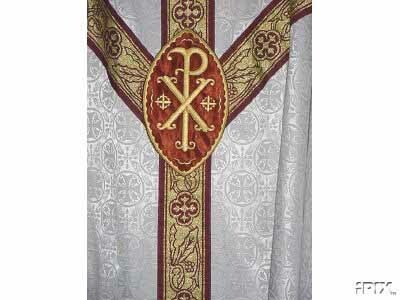 Has Y cross on the front. The orphery banding is blue with silver metallic material. 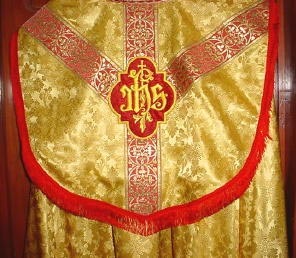 Chasuble & chalice veil are edged in imported French galloons & piping. It is NEW and not made on an assembly line. We make these one set at a time. 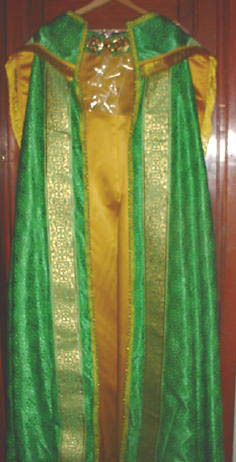 Comes with matching stole, maniple, burse & chalice veil. 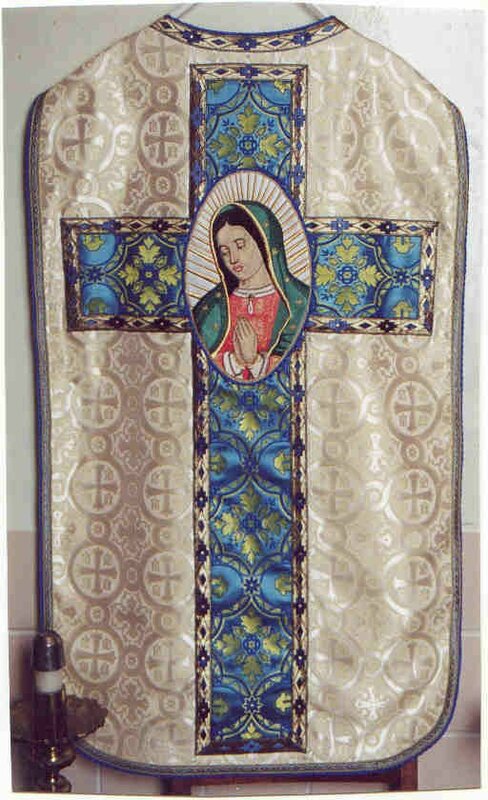 Traditionally blue vestments were used in Spain and South America, knows as the Toledo Rite, and also Sarum Rite, but are now used for feasts of the Blessed Mother in most countries today. 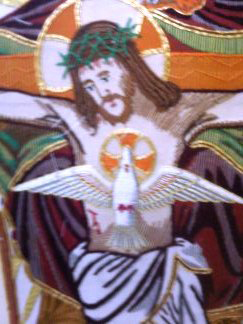 The photos show with a AM vesica OR Russian Icon vesica. Other vesicas are also available. 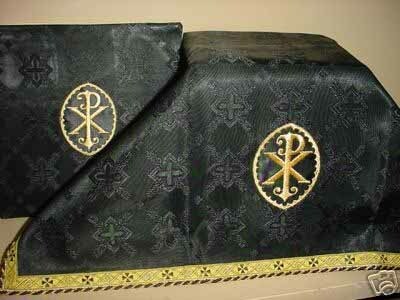 Beautiful traditional black Brocade Requiem Gothic. Black & silver satin orphery banding & vesica. 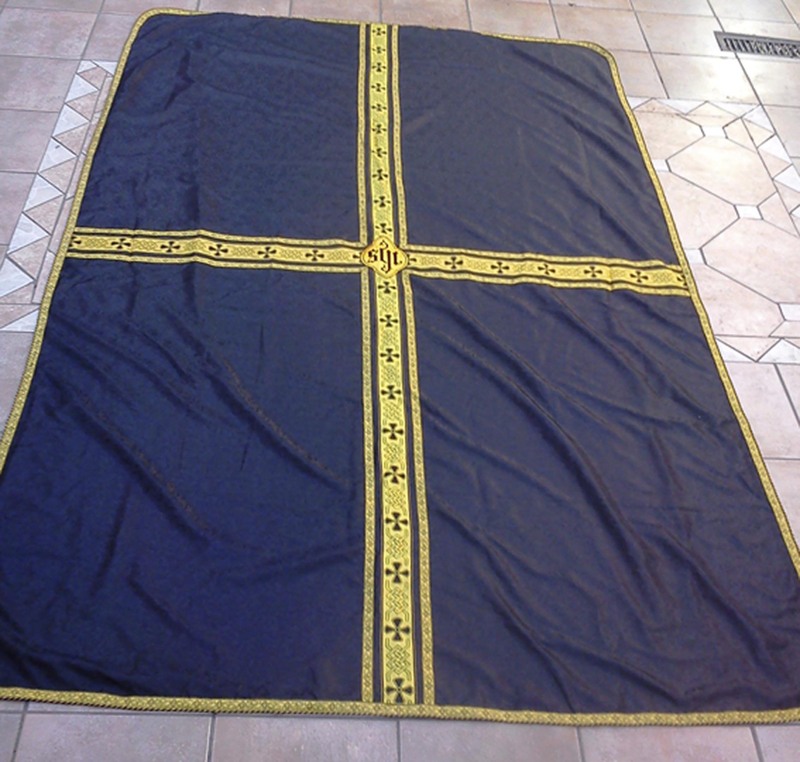 We also make traditional black requiem funeral palls, fully lined. Available with silver, gold or purple orphery banding. Incorporating traditional silver OR gold vintage French orphery bandings, galloons and piping. Backed in black flannel. Measures 7 feet by 11 feet long. 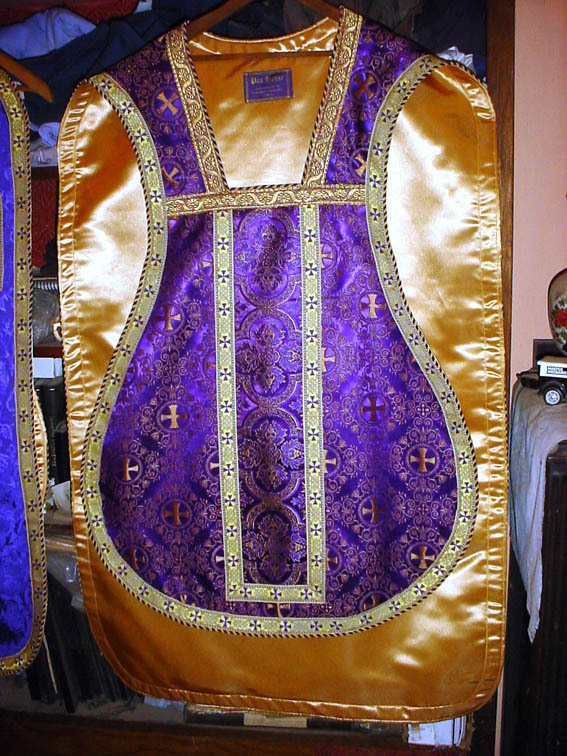 Purple available only by request..
Rose Gothic with purple & gold satin vesica. Lined in light blue satin. 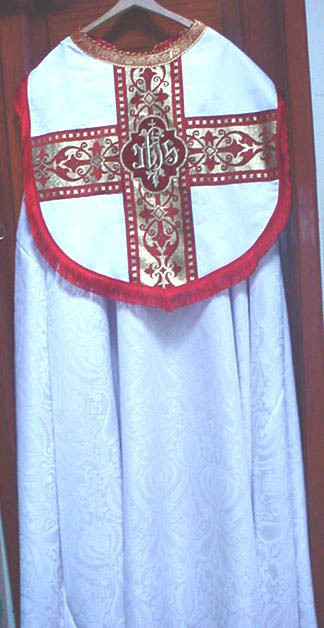 White Brocade Gothic with imported red satin Italian orphery banding. Emboidered vesica of the Sacred Heart. Other vesicas available. SEE the list below. 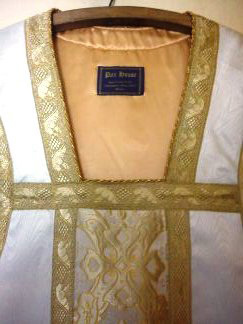 Gold satin Brocade with imported Italian orphery banding. Edged in imported French piping & galoons. 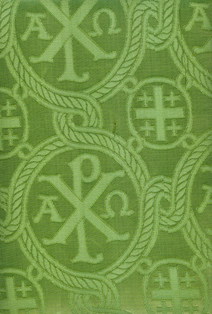 Green Brocade Gothic with traditional orphery banding and vesica. 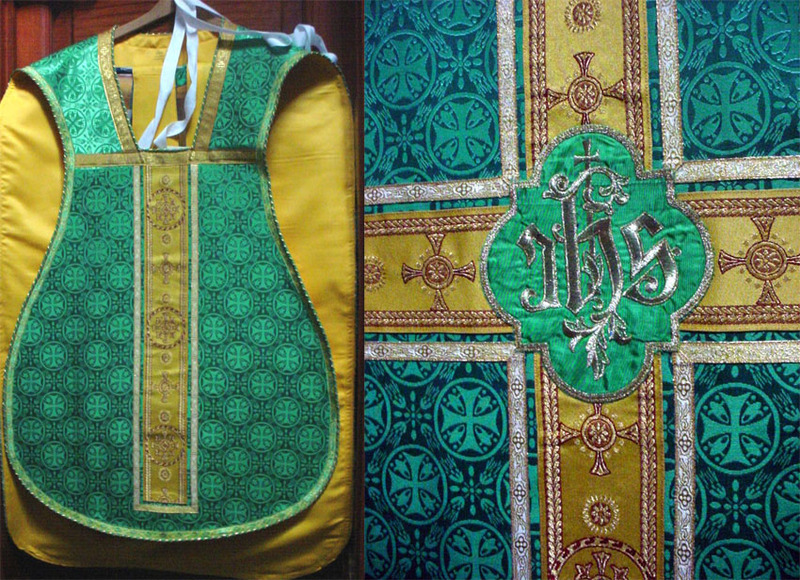 Imported French galoons and piping around chasuble. 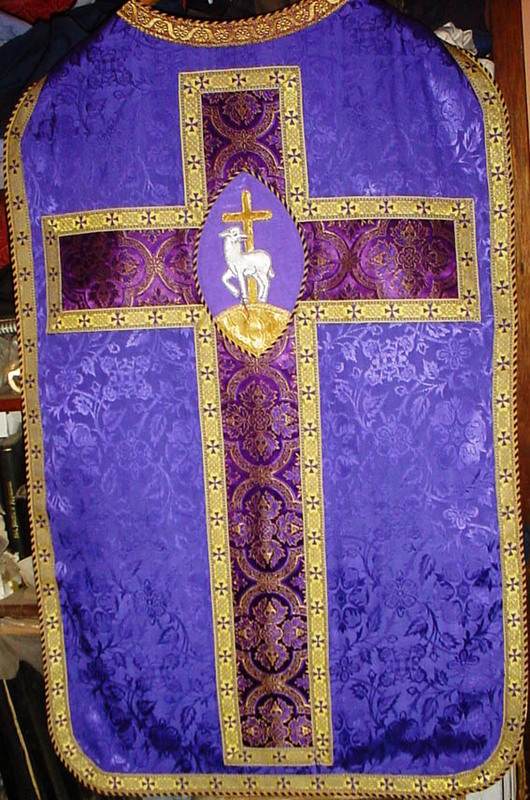 Purple Gothic vestment made with imported orphery banding from England, French galloons and piping. Fully lined in yellow satin. 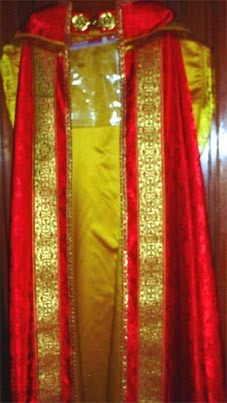 Comes with stole, maniple, burse & chalice veil & chalice pall. Complete red satin brocade lined in gold satin. 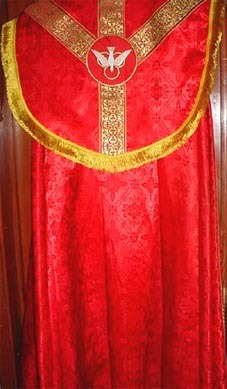 Comes with all parts, stole, maniple, burse, & chalice veil. White brocade with gold & burgandy orphery banding and galloons and piping. 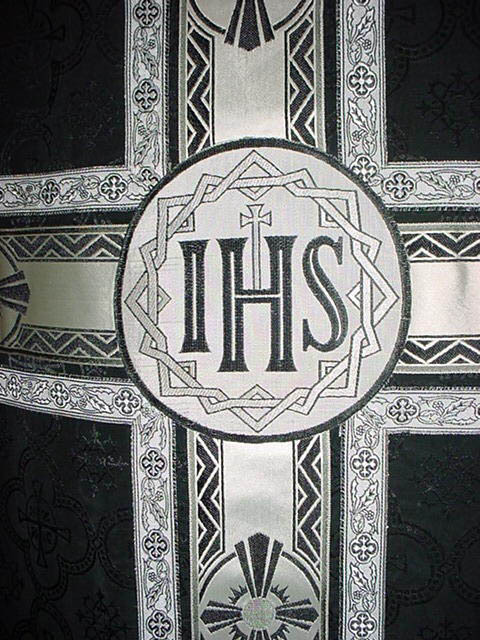 Available with IHS or ChiRho vesica on back. 48" long. Fully lined in burgundy satin. 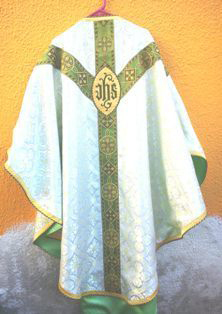 Comes complete with stole, maniple, burse & chalice veil. $500. 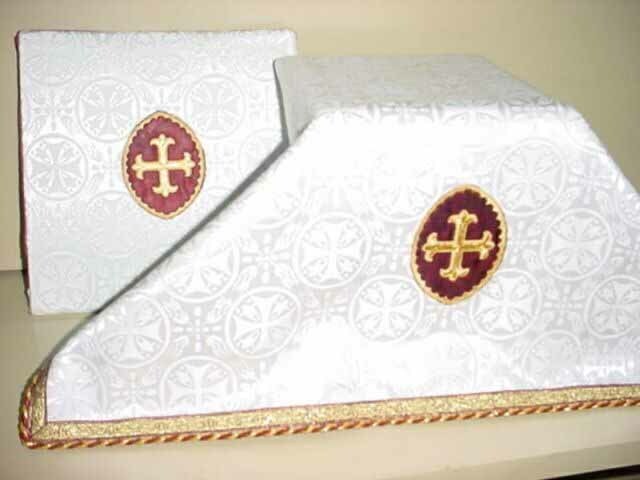 This is only one of many examples of the different styles and colors of copes we make. Fully lined in satin, gold plated broaches. All made of elegant brocade material and orphery bandings. 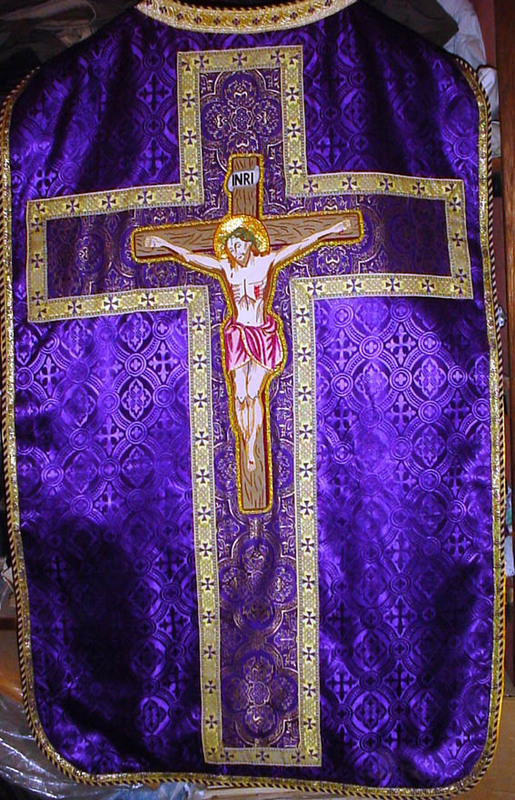 This is an example of some of the many beautiful copes we make. 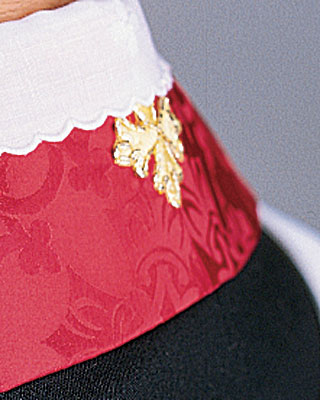 This is made of gold satin brocade , with red & gold banding, imported galloons and piping, fully lined in red satin. Comes with matching stole. We can make it to any length. .
Standard length is 58" measured from the back to the top of the shoes Comes with matching stole included. We can make this cope for a tall or short person according to the length you request. 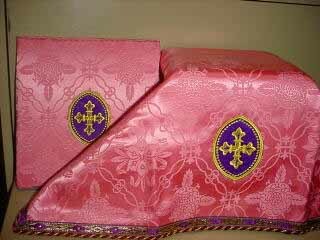 Also available matching humeral veil & burse for benediciton at extra cost. Magnificent gold bullion cope, all hand embroidered in real gold. We make this item only to order. Allow 3 months for delivery. 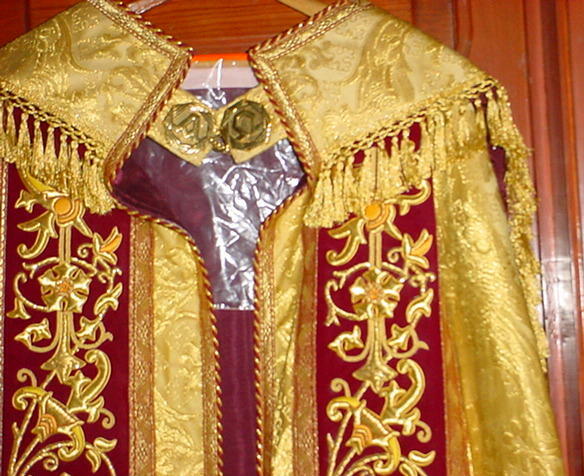 Made of gold brocade fabric, lined in burgundy satin and comes with matching stole. We can make this item to any length. We can also make a humeral veil or other parts by special request. Available in 6" or 12" tall size. We need your head size circumference in inches. 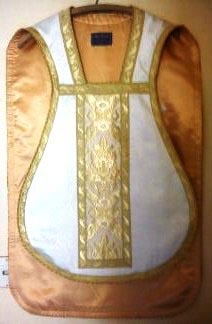 Complete matching set of Benediction vestments which includes a white cope, with humeral veil, matching stole and large burse. 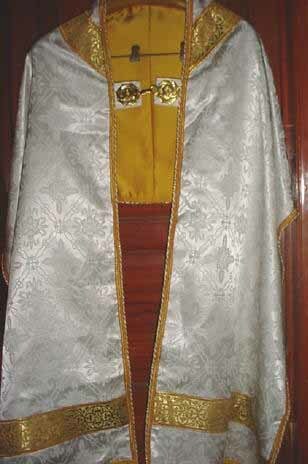 Made of fine white satin liturgical brocade, imported gold metallic banding from England, edged in piping and galloons. 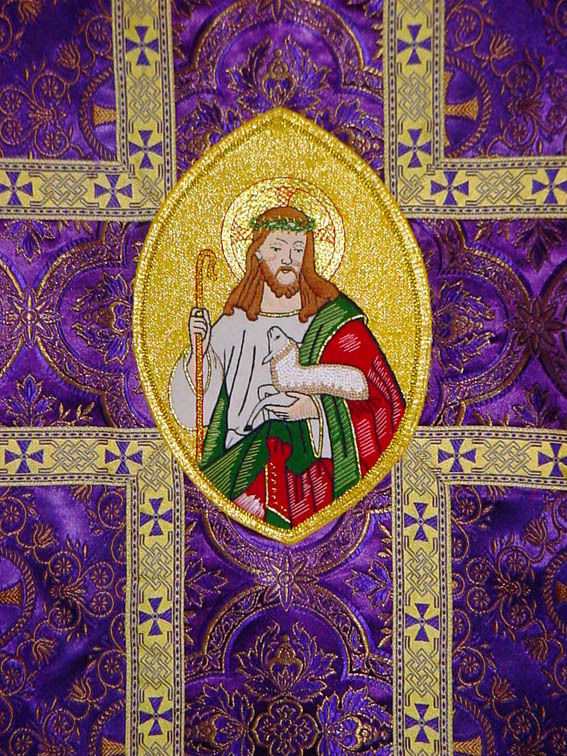 Has machine embroidered vesica of the Sacred Heart of Jesus on the veil, and Angus Dei on the cope. Lined in gold satin. 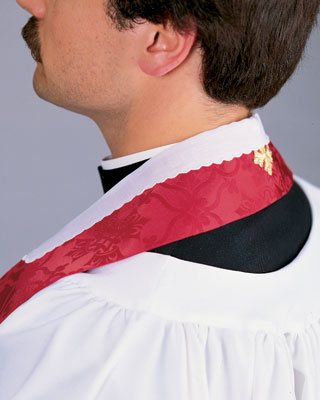 We can make the cope to any length desired for short or tall priest. 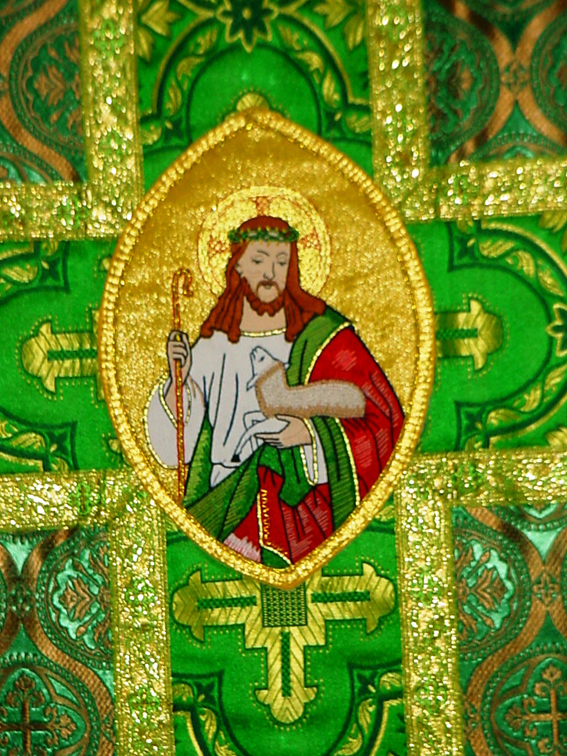 The bandings & vesicas on these vestments can be changed to any of the other ones listed in this page. 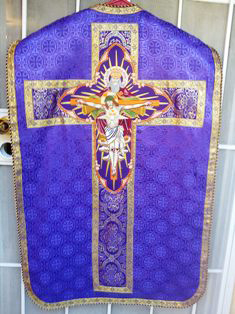 This is a NEW LARGE reversible violet & white confessional-communion stole made by our good sisters. 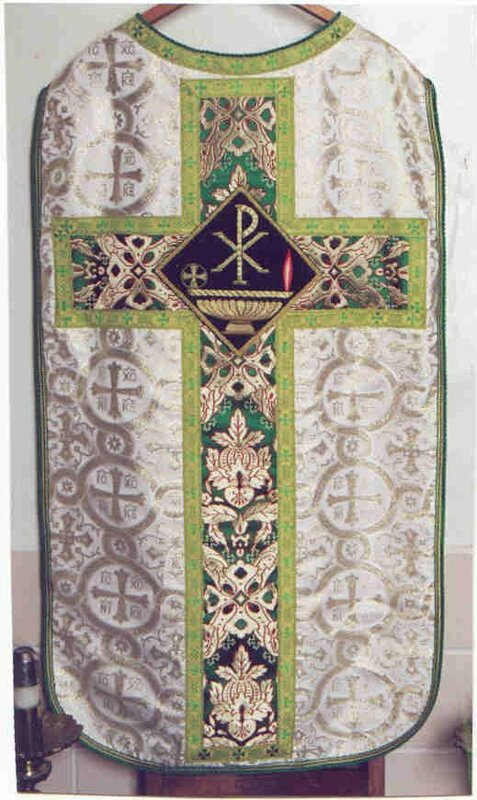 Made of imported traditional satin liturgical brocade materials. Measures 39" down one side. You dont find these being made anymore these days. Also available in any other colors reversible you wish. 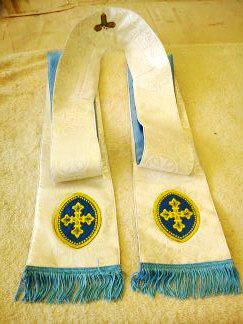 Also available as Deacon's stole. In any two colors $100.00. 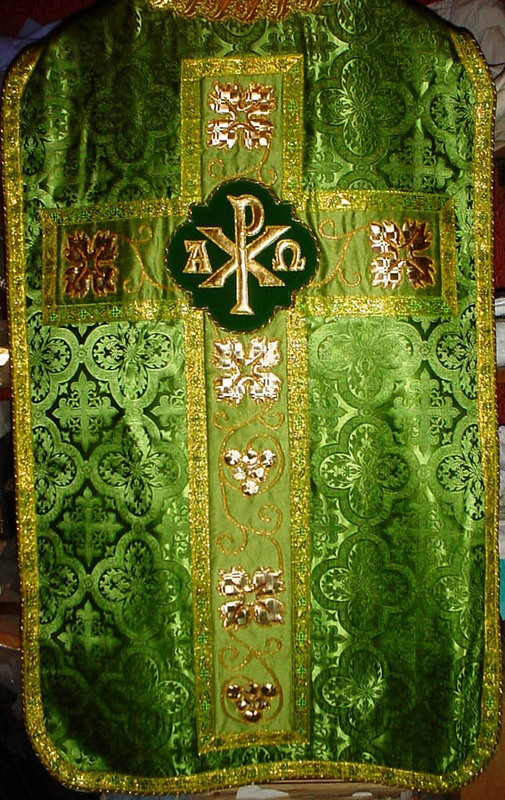 NEW all hand embroidered vesicas imported from someplace, Using real gold bullion thread.Any of these vesicas can be used on either a Roman or Gothic vestment per your request. The price for each of these is $50 extra. Specify either Good Shepherd or Chalice when ordering one of these items. 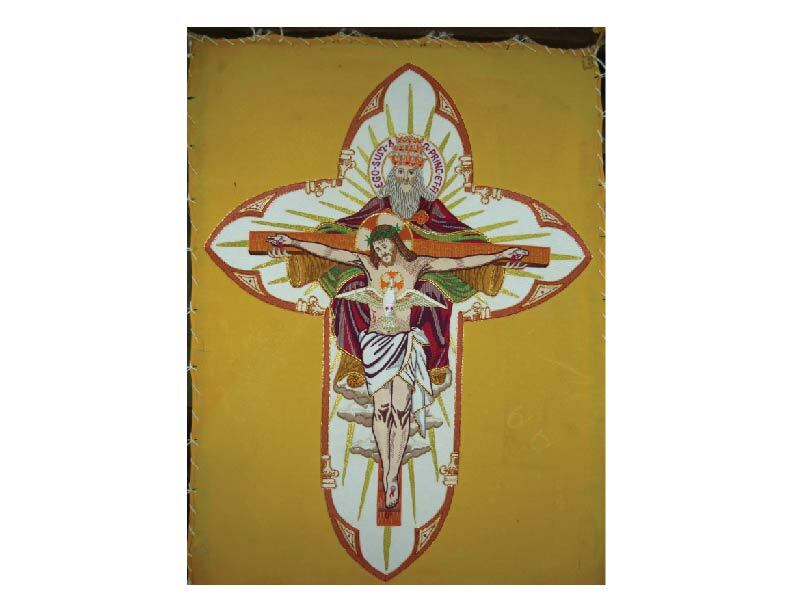 The price is $300 for this vesica to be applied an any vestment or color fabric. .
NEW HAND EMBROIDERED CRUCIFIXION VESICA. Beautifully embroidered vesica is available to put on any of our vestments you would like to order. We can put this on either Roman & Gothic style. Vescias are sold only on our vestments. They are NOT sold separately. 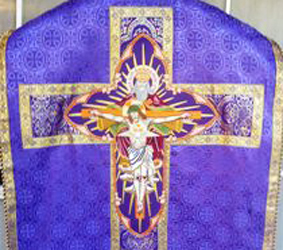 Beautifully embroidered vesica is available to put on any of our vestments you would like to order. 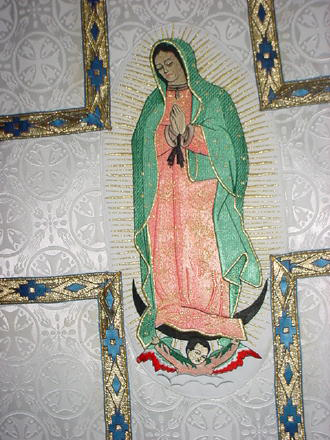 We can put this on either Roman & Gothic style.Most appropriate on a Marian vestment. 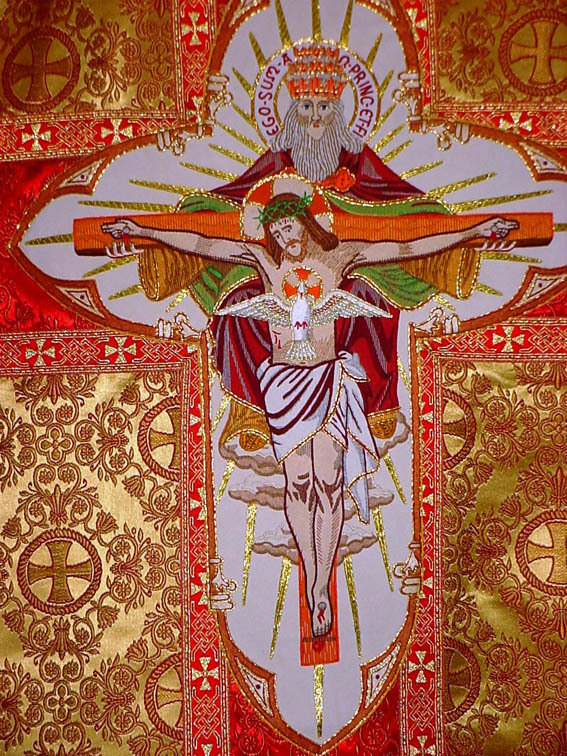 Beautifully embroidered vesica is available to put on any of our vestments you would like to order. 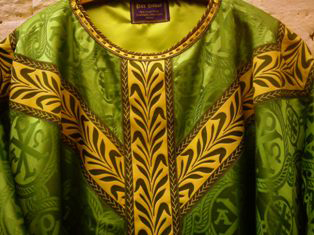 We can put this on either Roman & Gothic style.Availabe in ANY color.. 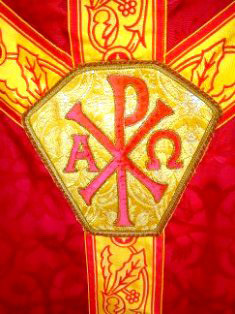 Beautifully embroidered vesica is available to put on any of our vestments you would like to order. We can put this on either Roman & Gothic style.Availabe in ALL color. 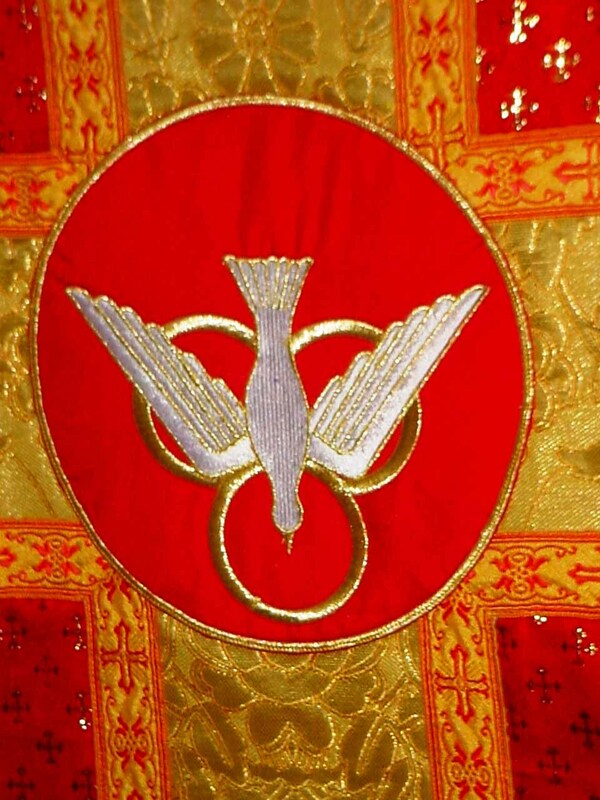 This vesica is included in the price of all our vestment designs. 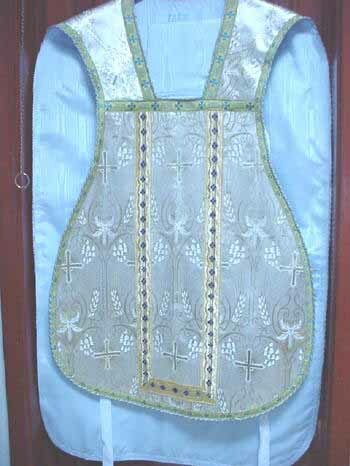 its included in the cost of a vestment. 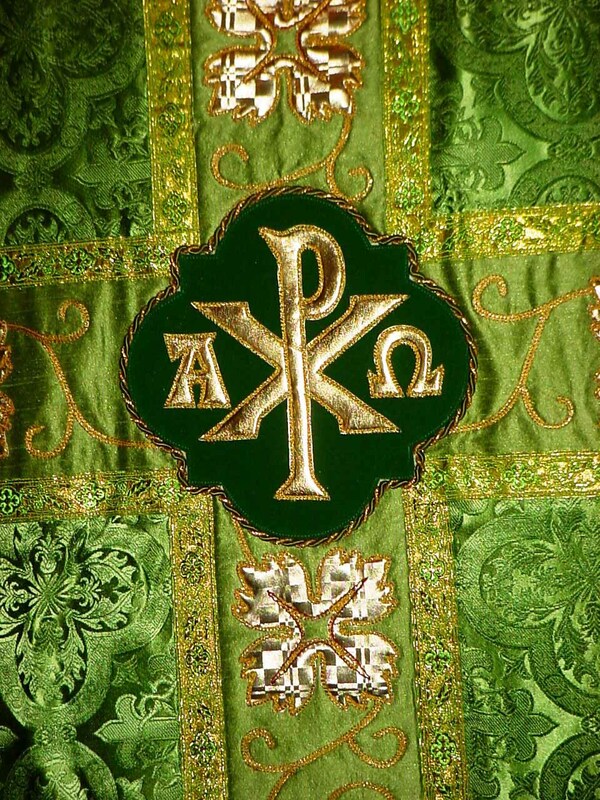 Beautifully embroidered vesica is available to put on any of our vestments you would like to order. We can put this on either Roman & Gothic style. 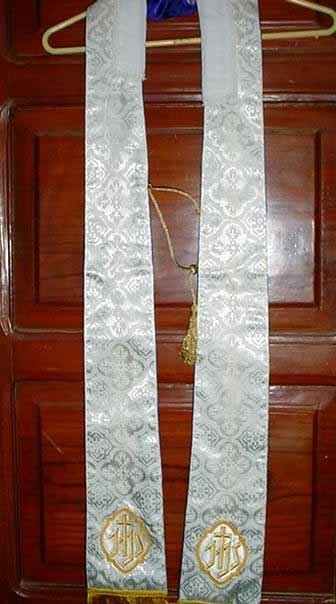 Ideal for Marian vestments. 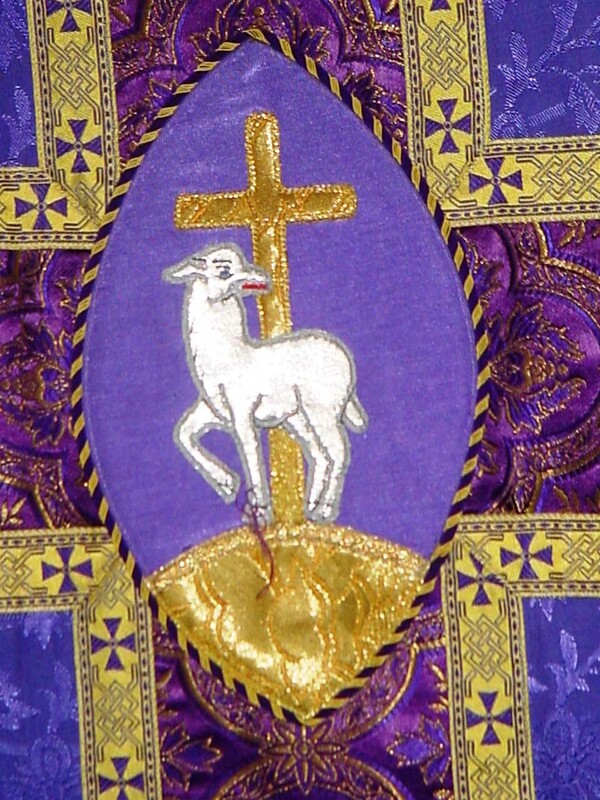 Beautifully embroidered vesica is available to put on any of our vestments you would like to order. We can put this on either Roman & Gothic style. 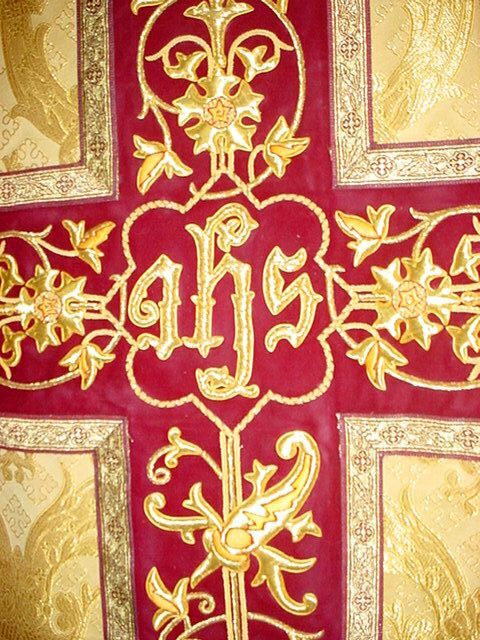 This can be used on white, gold, red, or violet vestments. . 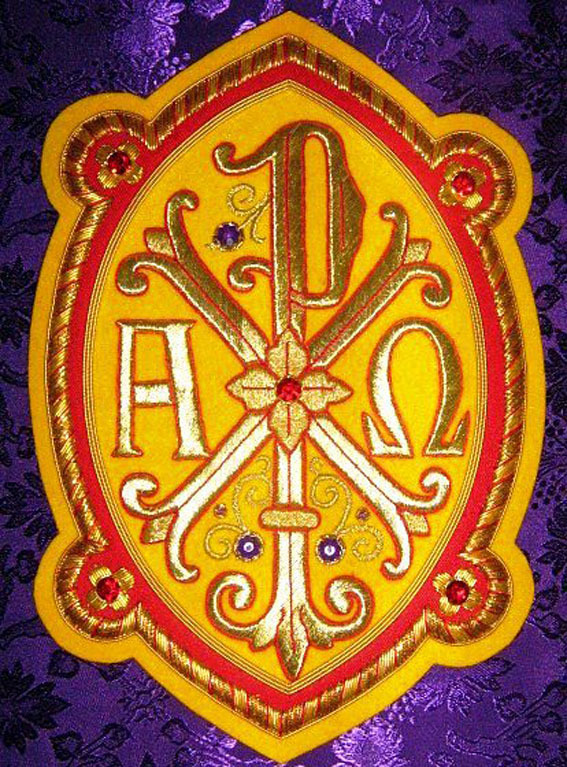 Beautifully embroidered vesica is available to put on any of our vestments you would like to order. We can put this on either Roman & Gothic style. Availabe in ALL colors. 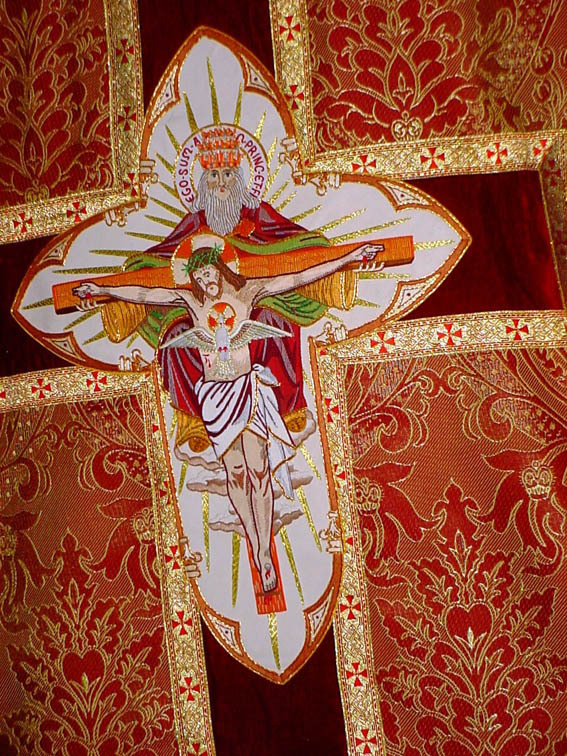 This vesica is included in the price of all our vestment designs. 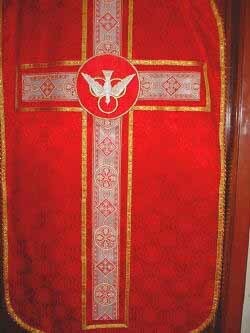 Beautifully embroidered vesica is available to put on any of our vestments you would like to order. We can put this on either Roman & Gothic style. 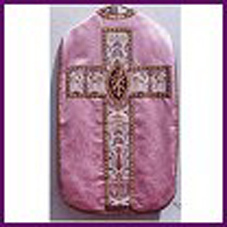 Ideal for any Marian vestment, to put on white, blue, gold or Rose brocade. 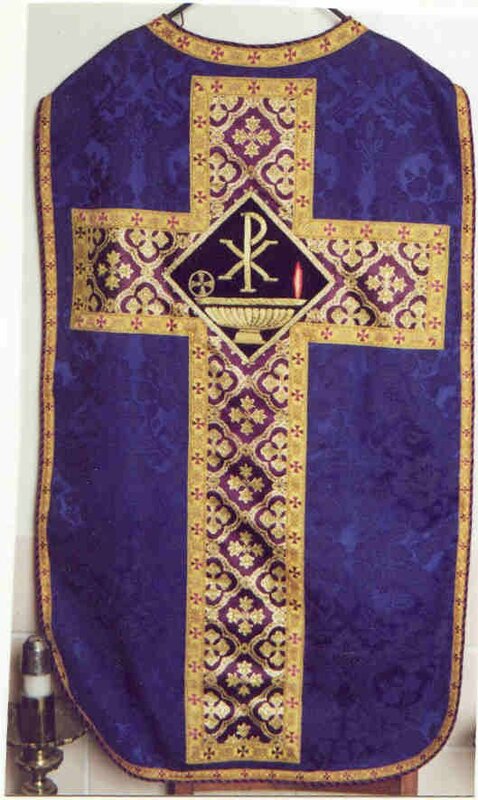 Beautifully embroidered vesica is available to put on any of our vestments you would like to order. We can put this on either Roman & Gothic style. 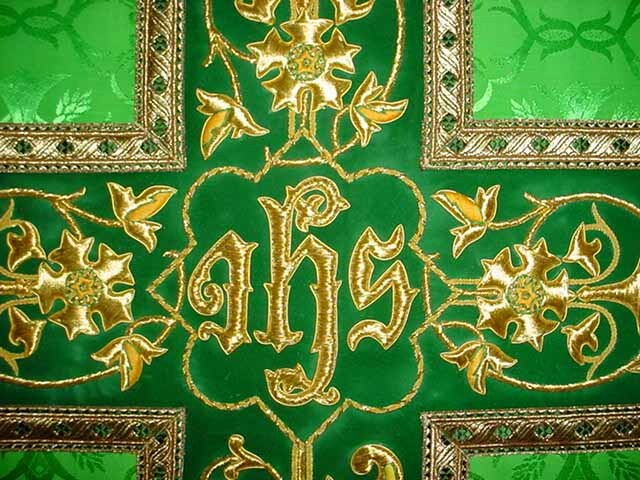 Ideal to use on white, red, gold, or violet vestments. 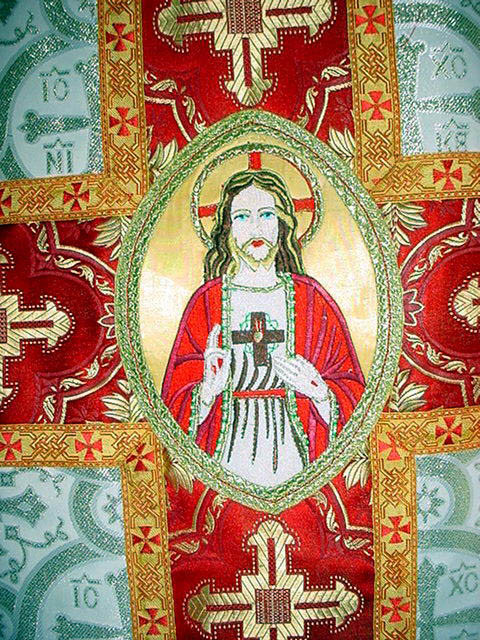 Beautifully embroidered vesica is available to put on any of our vestments you would like to order. We can put this on either Roman & Gothic style. Available in ALL colors. 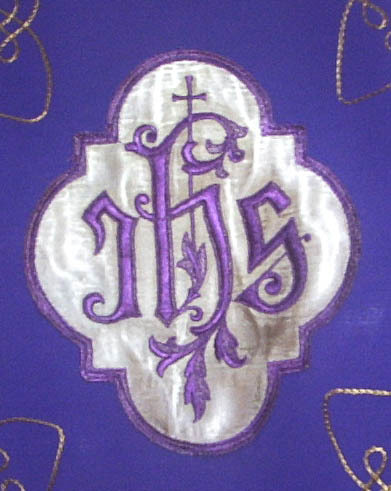 Beautifully embroidered vesica is available to put on any of our vestments you would like to order. We can put this on either Roman & Gothic style. 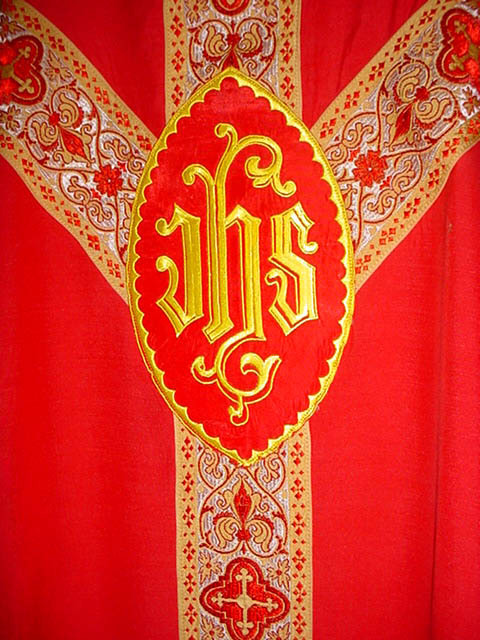 Ideal on Red, white or gold vestments. Nice to use for Pentecost Sunday. 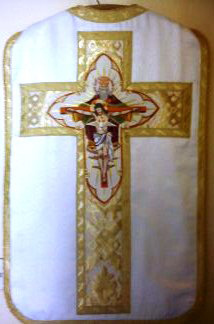 Beautifully embroidered vesica is available to put on any of our vestments you would like to order. We can put this on either Roman & Gothic style. 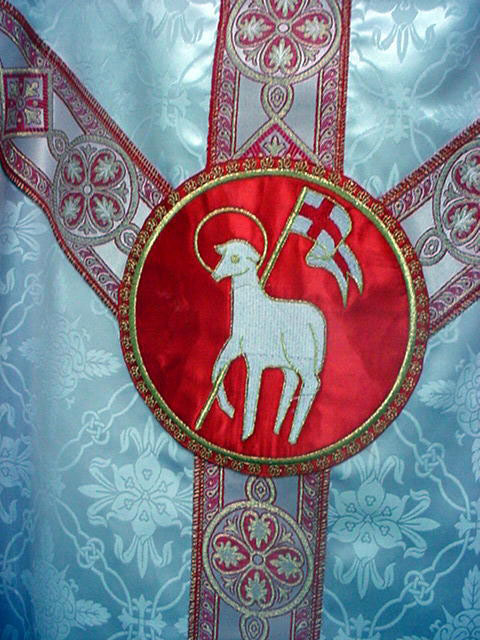 Ideal for white, gold, blue or rose vestments. 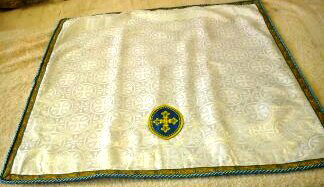 Beautifully embroidered vesica is available to put on any of our vestments you would like to order. We can put this on either Roman & Gothic style. 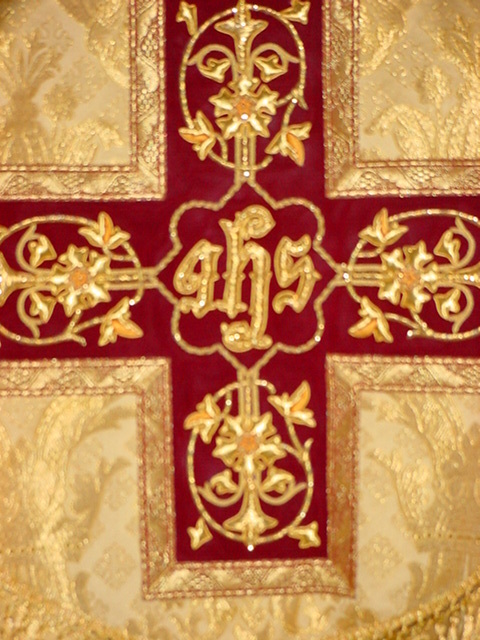 Ideal on white, gold, red, or violet vestments. We have a large assortment of standard size used chalices veils in good condition in ALL colors available for the low price of just $25 each whilst supplies last. Sorry NO photos will be provided. Its a grab bag , pot luck offer. NO returns. Let us know which colors you would like and we will send you the best we have. We have a large assortment of standard size used maniples, burses & stoles in good condition in ALL colors available for the starting low price of just $25 each whilst supplies last. Higher prices for more fancy schmancy ones. These are all individual parts, they do not match each other. Sorry NO photos will be provided. Its a grab bag , pot luck offer. NO returns. Let us know which colors you would like and we will send you the best we have. .